Below are some 'before' and 'after' shots of our most recent project a 62,000 km. 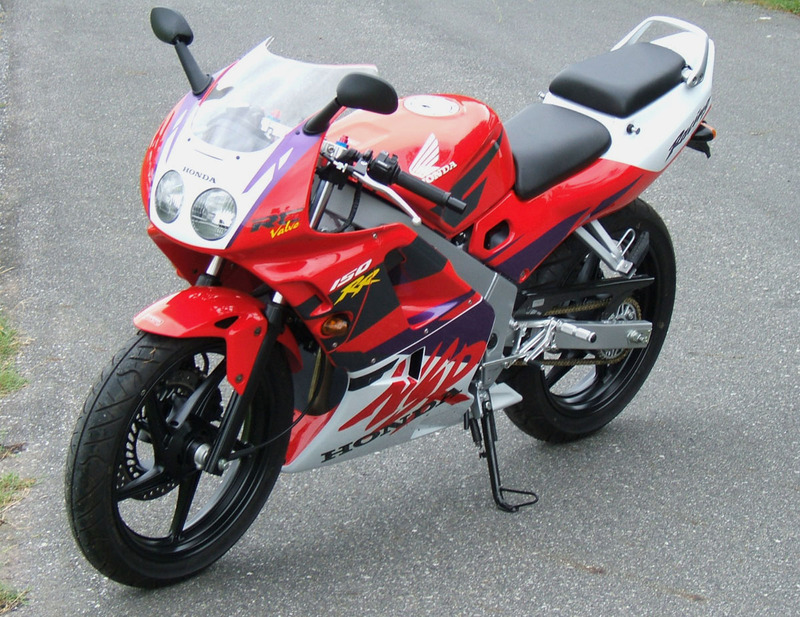 16 year old NSR150R. In case anyone is contemplating a similar project, a detailed account on how we transformed it from the condition on the left, to the condition on the right,in a few short months is listed below. Be warned, it is a long story. 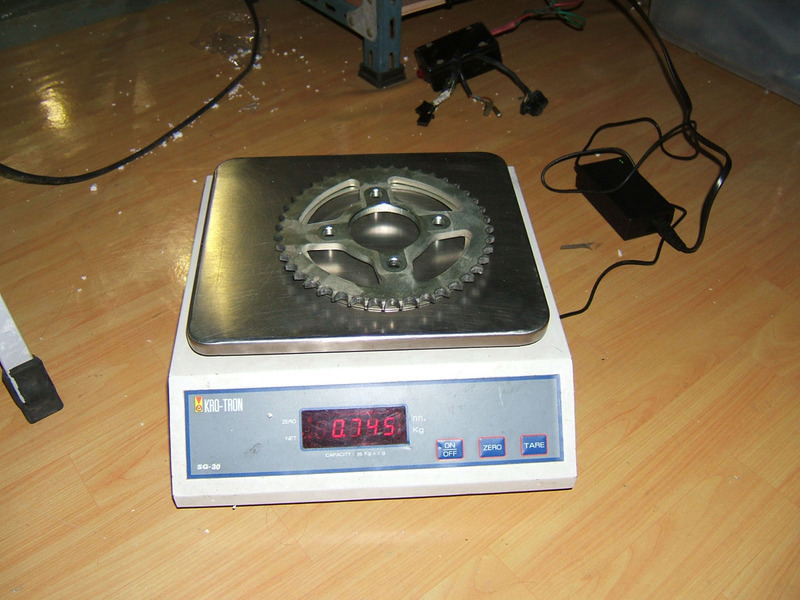 For such a small bike it was a big project! 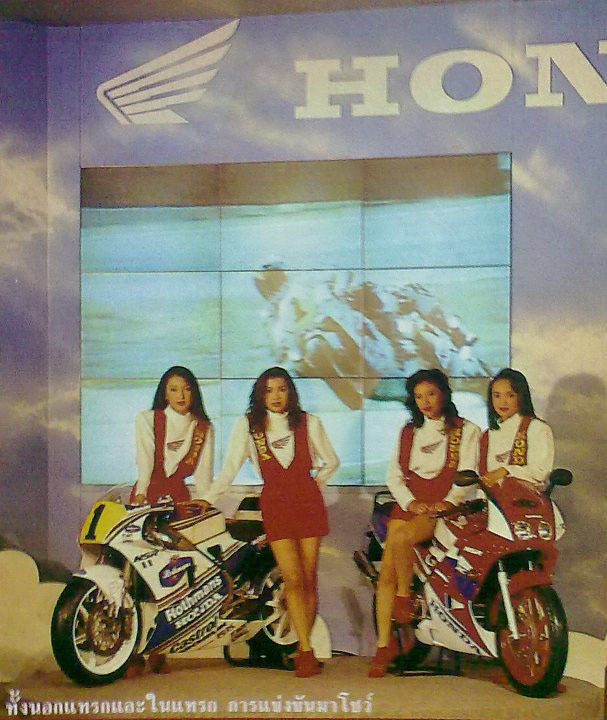 The year was 1994 and for the first time since 1989 Honda won the 500 cc. 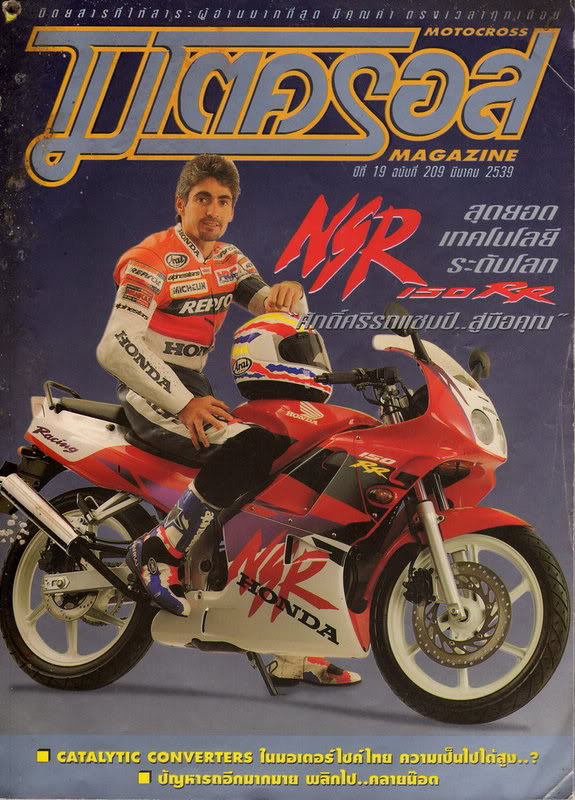 World Championship with Mick Doohan on the mighty NSR500. 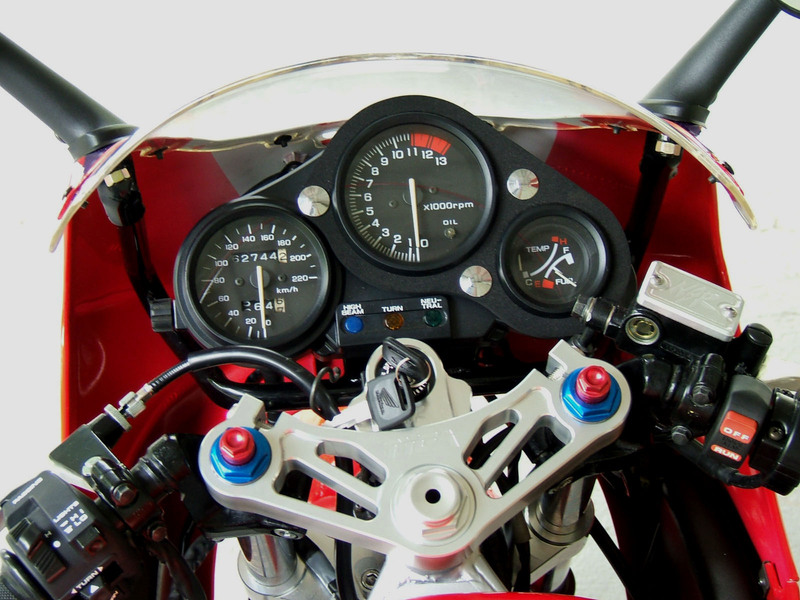 It was the first and only year that the manufacturer had been without a major sponsor in modern times, and the bike was finished in 'HRC" factory colours allowing Honda to gain maximum publicity and marketing advantage. 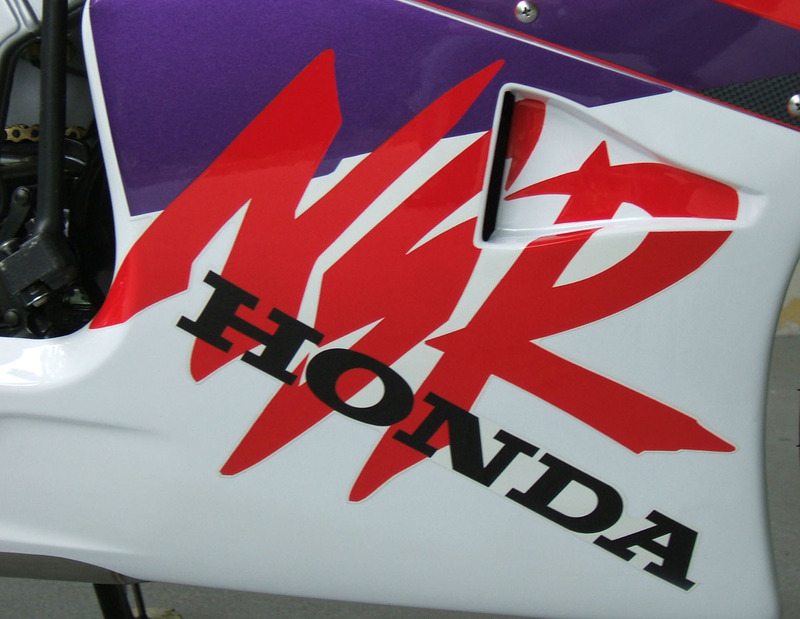 This scheme was emblazoned with a huge NSR graphic on the flanks. 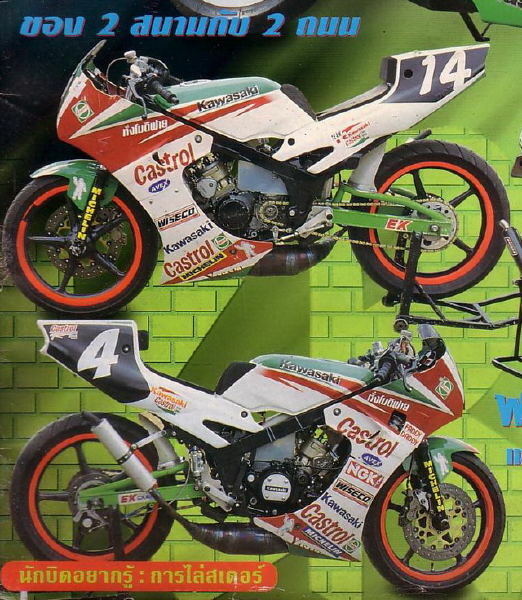 This was the only time that I can recall a single model has been given the largest and most prominent position on a premier class racing motorcycle's bodywork. It was quite an honour. 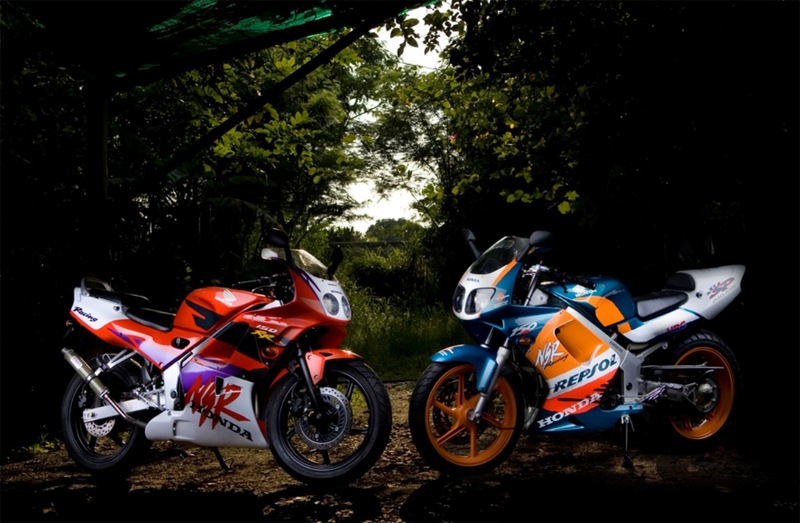 It said a lot about how important and how proud Honda were of the NSR500 which incidentally was the most successful racing motorcycle of all time. Alternatively, a cynic might point out that it was not their 500 race bike which they were celebrating, but their range of sports two stroke motorcycles which they were advertising. Either way, here at TYGA it is fine by us; we have always been firm supporters of the NSR in all its various guises throughout the years. It is really no accident that TYGA Performance was born in Thailand, which has always been a country of motorcycles and any foreign visitor can not help but notice that bikes and scooters are everywhere. 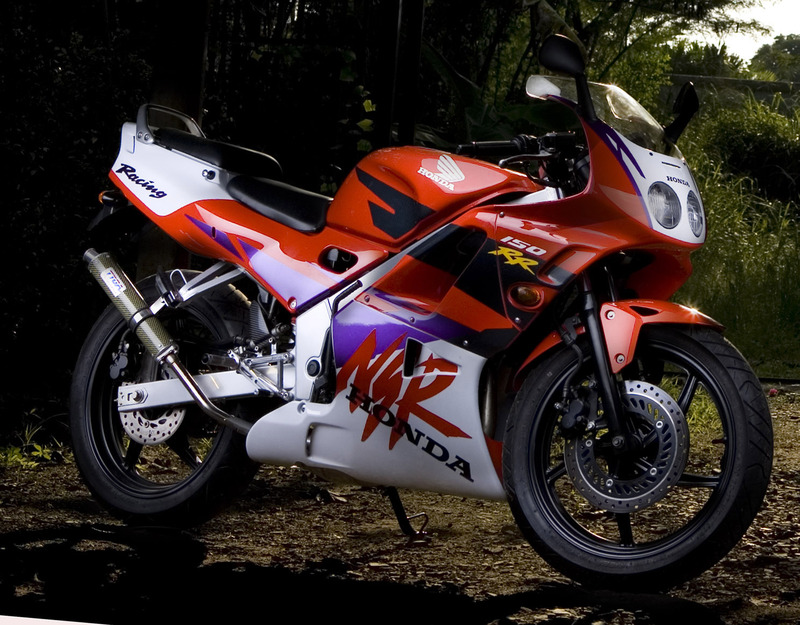 During the 1990s, unlike today, the two stroke sportsbike was the obvious choice for any young aspiring boy racer. 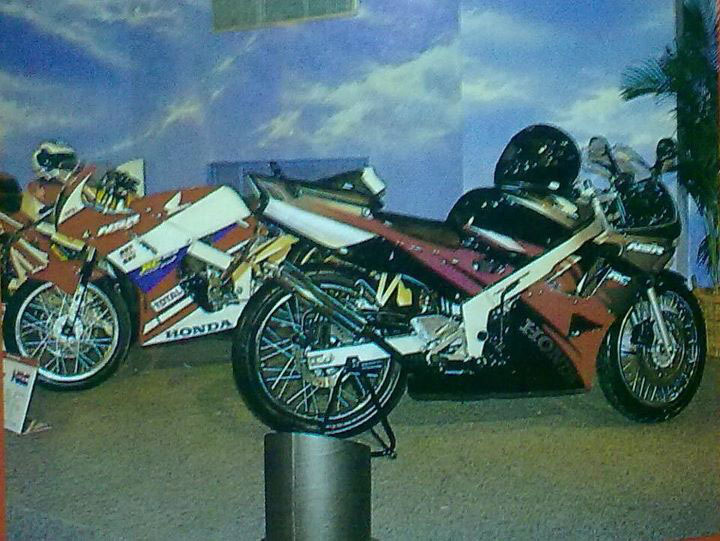 All the manufacturers made high performance 150 cc sports machines and these were the flagships of the range back then. 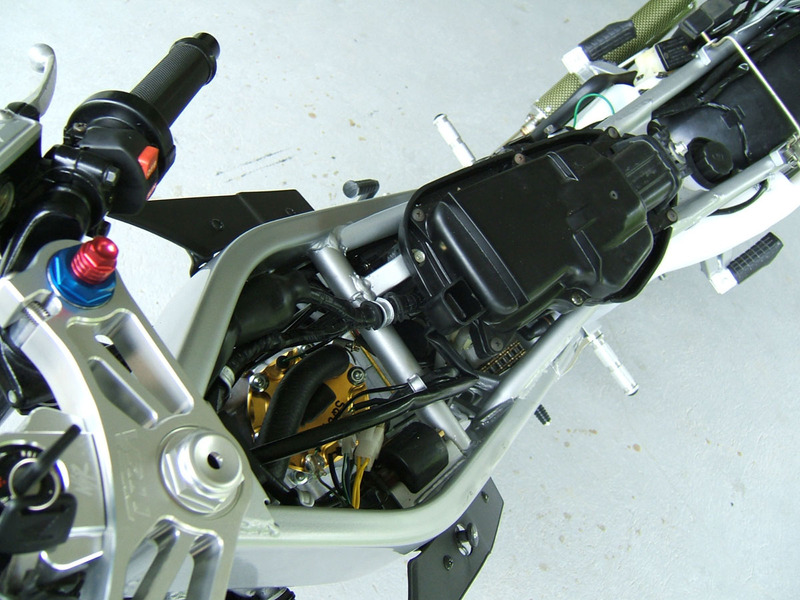 A company's reputation depended on having a high performance, high tech sports bike which was at the same time affordable and rugged. This type of bike had a steel frame and basic suspension with just adequate brakes but the engines were as advanced as anywhere in the World and typically capable of nudging 150 km./h in stock trim and 160+ with mild tuning. Weighing in at a little over 100 kg., these pocket rockets are certainly more lively than the latest batch of wheezy four strokes that have been imposed on the youngsters of today. 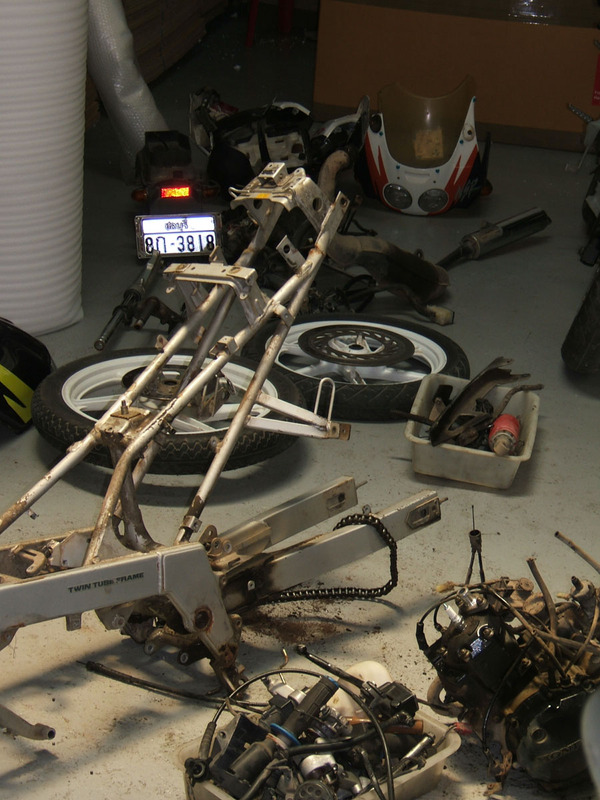 Many bikes were highly tuned and modified by their owners with major components such as brakes removed and the infamous Bangkok street races with hundreds of participants and thousands of onlookers were a nightly occurrence with the inevitable human and legal consequences. 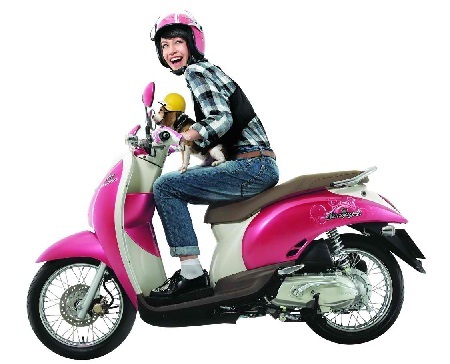 Something had to change, and with a special levy on new two strokes, a very heavy marketing campaign by the manufacturers towards four strokes, and a general move towards economy and utility, the country moved back from a stink wheel enthusiast's paradise to the sane, feminine hygienic scene we have today where the modern teenager is more likely to be seen cruising on a pink scooter. Oh how things have changed! Bangkok is a lot cleaner and quieter but a lot less exciting as a result. 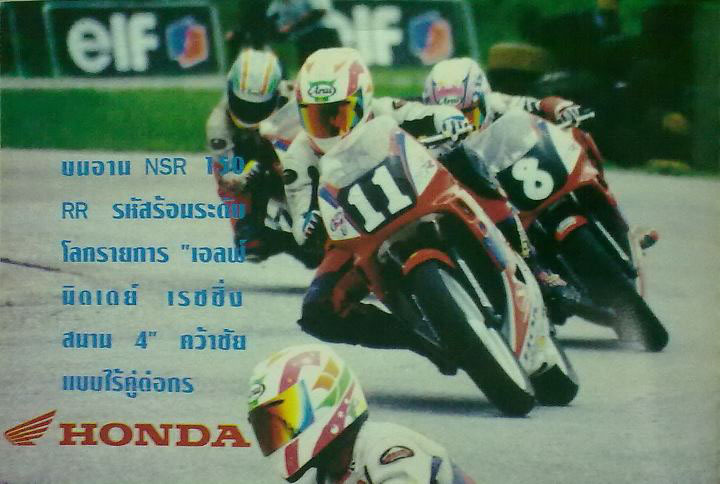 Anyway, getting back to specifics, i.e.. the mighty NSR; this represented Honda's entry in the performance stakes in Thailand, to be pitted against the other Japanese brands 150 two strokes. 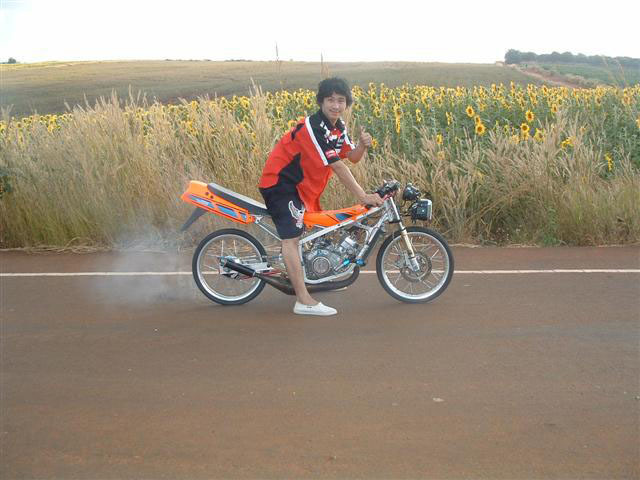 Try to think two stroke mini Fireblade if you will, and you get the idea. 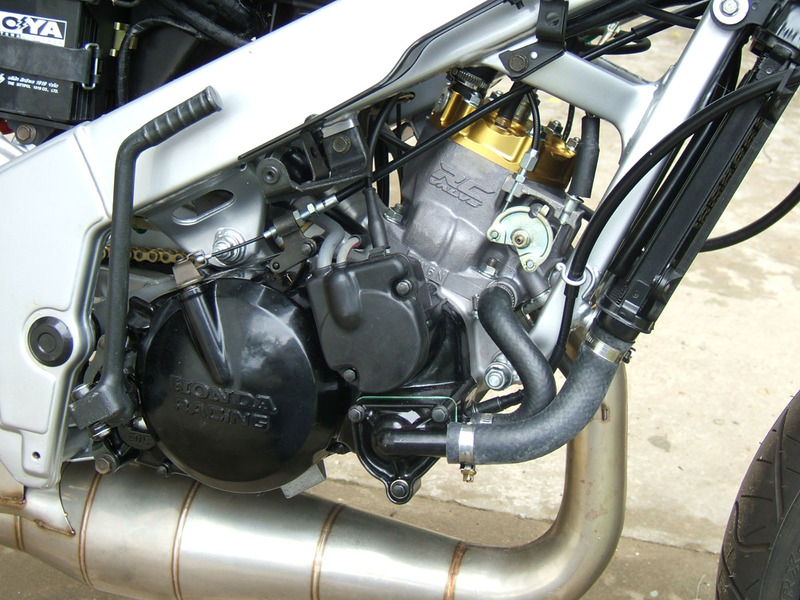 The first generation NSR150 had a technically advanced single cylinder two stroke engine with RC valve, water cooling and modern ignition unit. Due to the specification and the extra capacity, it had more power than the equivalent 125s the rest of the World were riding. It had a rectangular headlight and rectangular styling to go with it. 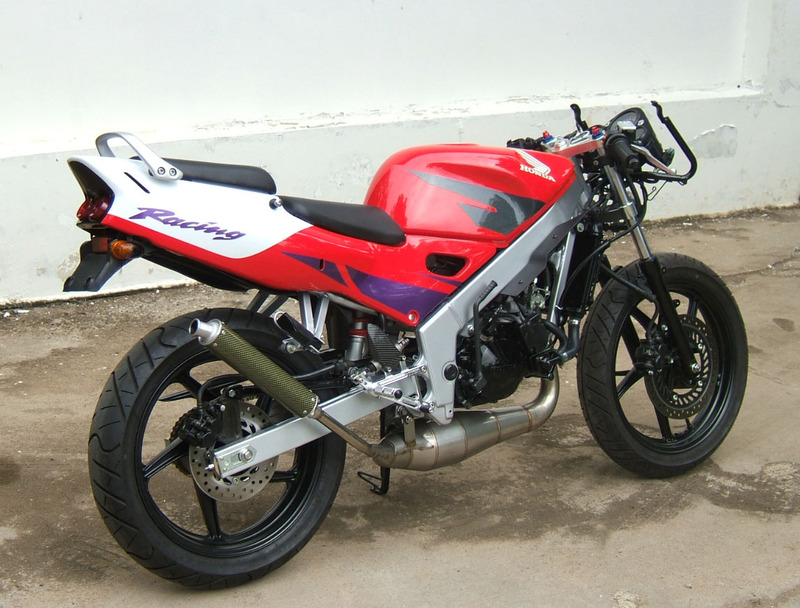 Launched in the late 80s it fitted in with the bigger street Hondas of the day and was a huge sales success. 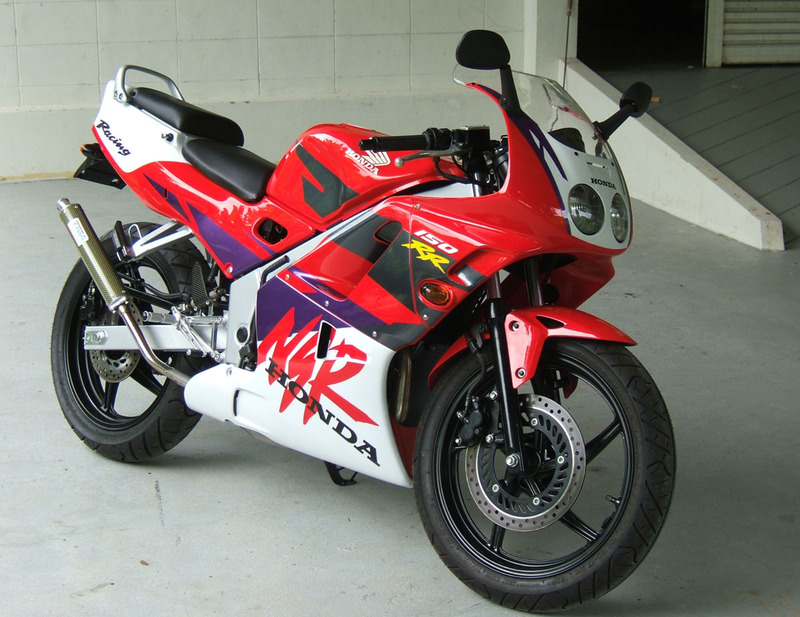 Despite having a paint scheme that was the same as the NSR250s, it never really looked like a GP bike or even an NSR250) street bike for that matter. 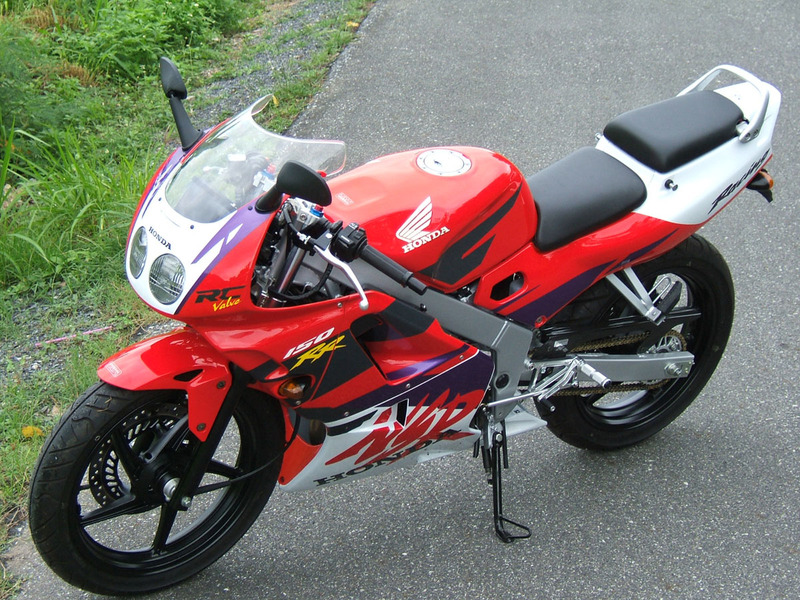 By 1993, the next generation was launched with round headlights and the styling was much more in keeping with the NSR250 and NSR500 GP bikes of that period. 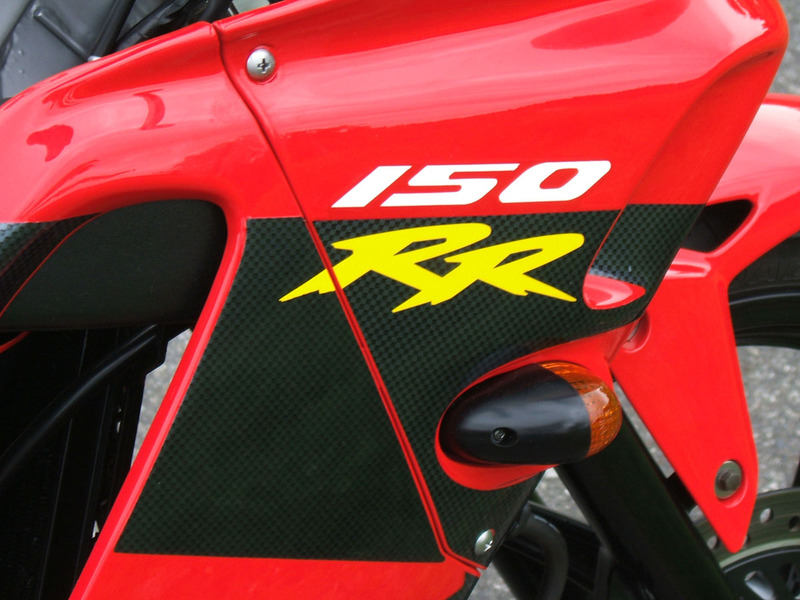 This was known as the NSR150R. Technically, it was similar to the previous generation but had 17 inch wheels front and rear. For upcountry, It still had an option for spoked wheels which when seen from today's perspective look very out of place. 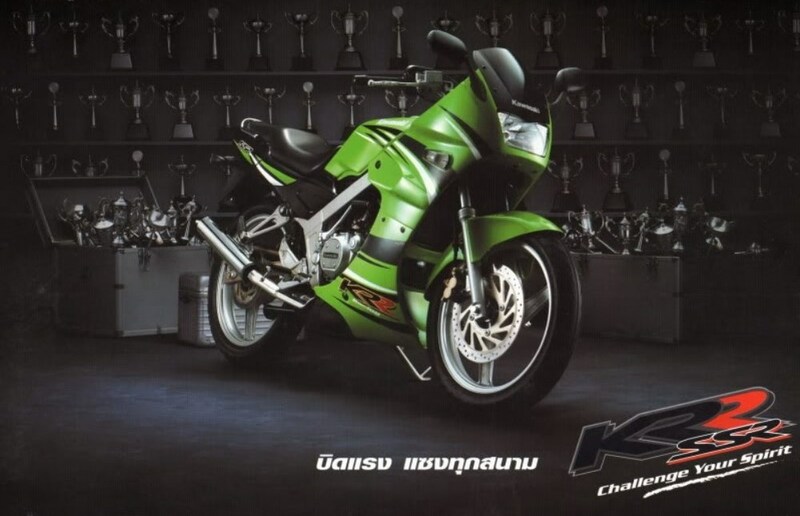 This model sold hundreds of thousands and they could be seen revving up at every set of lights in Bangkok along with the Yamaha TZM150s and Kawasaki KR150s. The final generation, launched in 1997, had the faired in headlight and came in the Pro Arm SP version with the higher spec engine and the RR lower spec cheaper version. 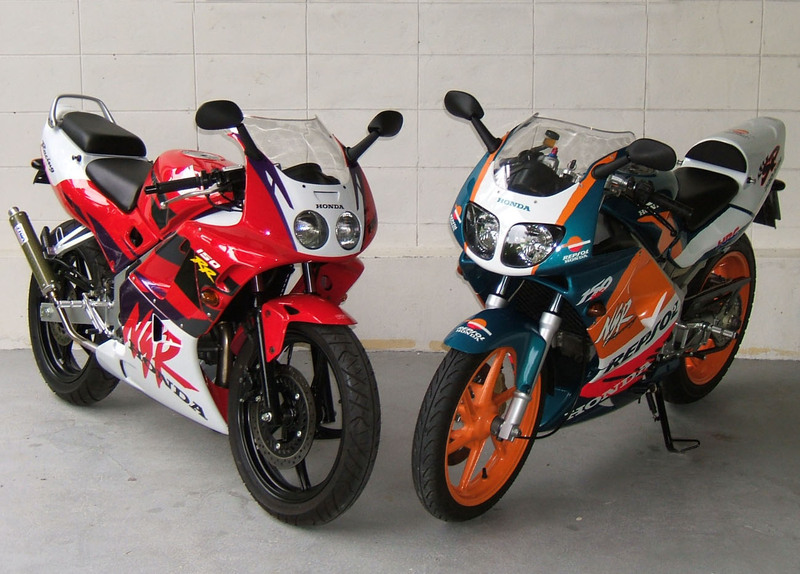 Unlike the previous two models, sales were disappointing due to their higher cost increased taxation on two strokes and the economic crisis in Asia and eventually many were exported to Australia to clear the remaining stock. 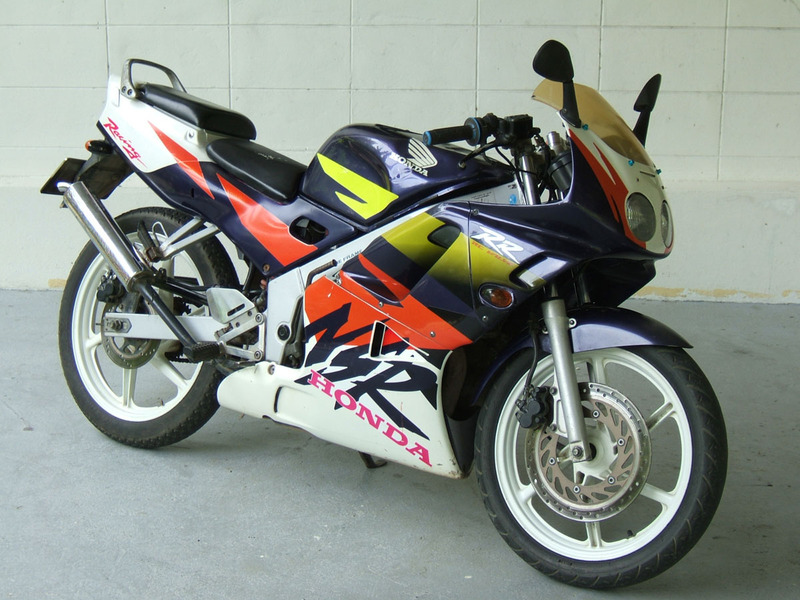 Honda enjoyed considerable racing success with the NSR150, and like its GP cousins was the dominant force in the classes it competed in. 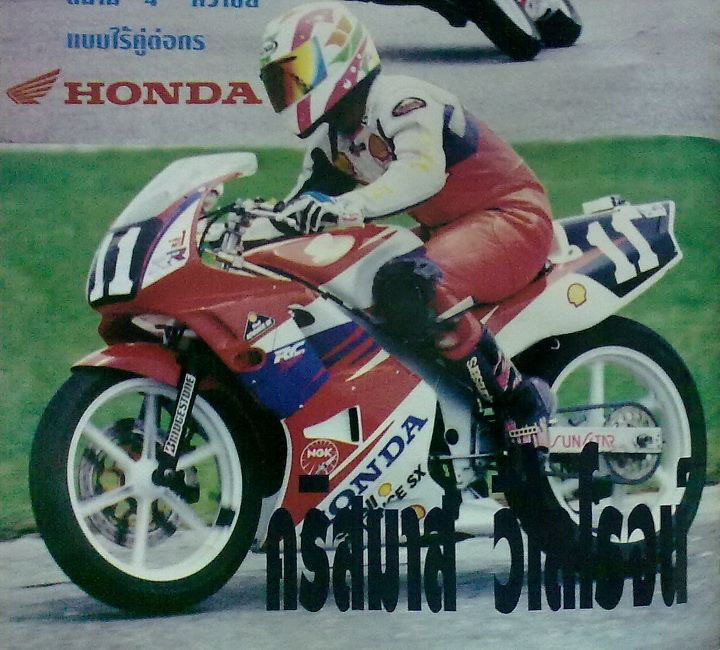 It won numerous Thai national and FIM Asian championships with Thai riders such as Christmas Wilairot (father of Moto 2 rider Rattapak) and Derek Anchawong. Our very own Matt Patterson didn't do too badly either, always being in contention! 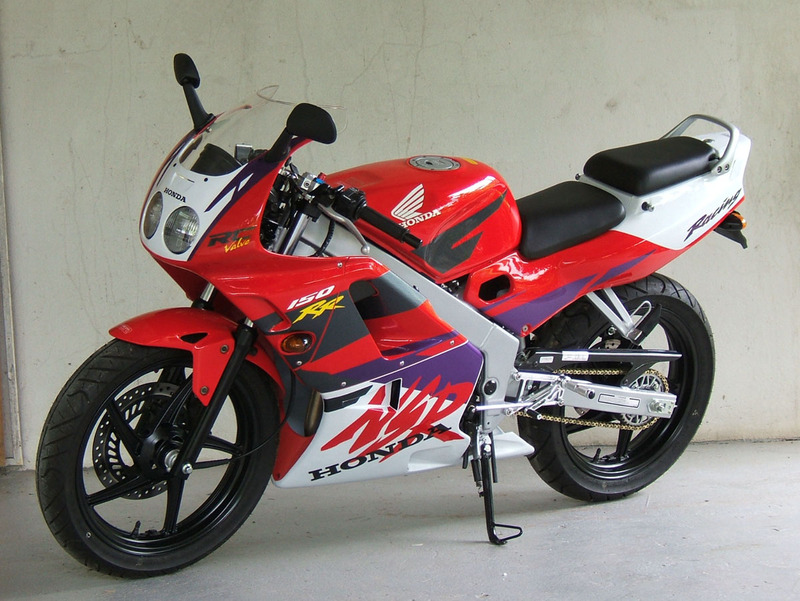 So this brings us neatly to our latest project which is 'ta kom' (round eye) NSR150RR of 1995 vintage. Like the NSR250 MC28, Honda exploited Micky D's success to full advantage and offered the 150 in his race winning colours. 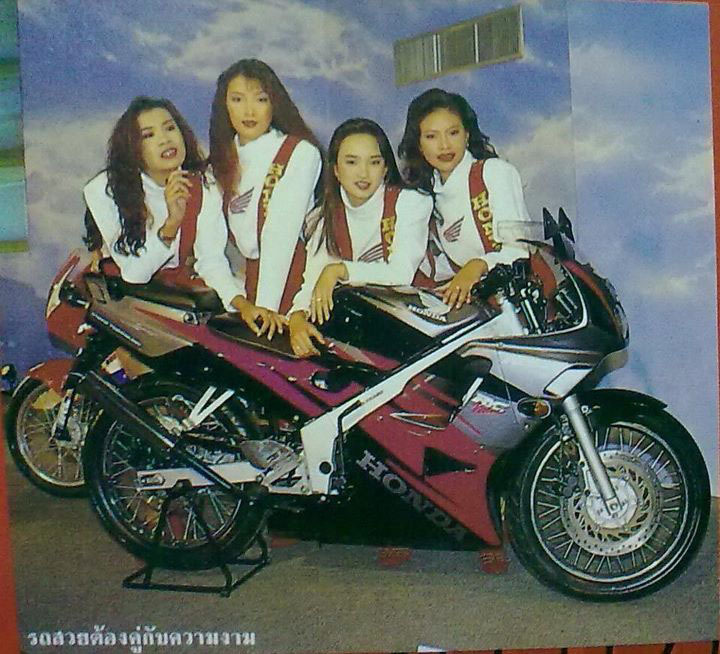 One of the photos show the 1995 Bangkok Motor Show with Micky sitting on board the 150RR endorsing it as part of the NSR range. Another shows me getting up close and personal at the same show with his bike which was a lot more interesting being my all time favourite motorcycle. 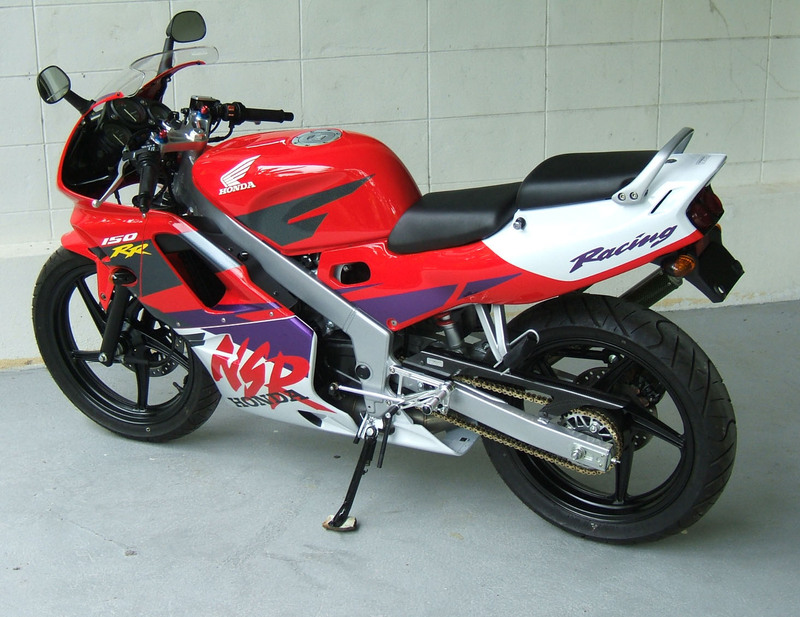 Since those days, we've dallied with a lot of NSRs, mostly 250s, but the odd, 150SP or three and even an NSR50. However, we've never done a 'ta kom' and it suddenly occurred to us that if we didn't do one soon all the hundreds of thousands that had been zooming around Thailand would be gone and we'd be too late. 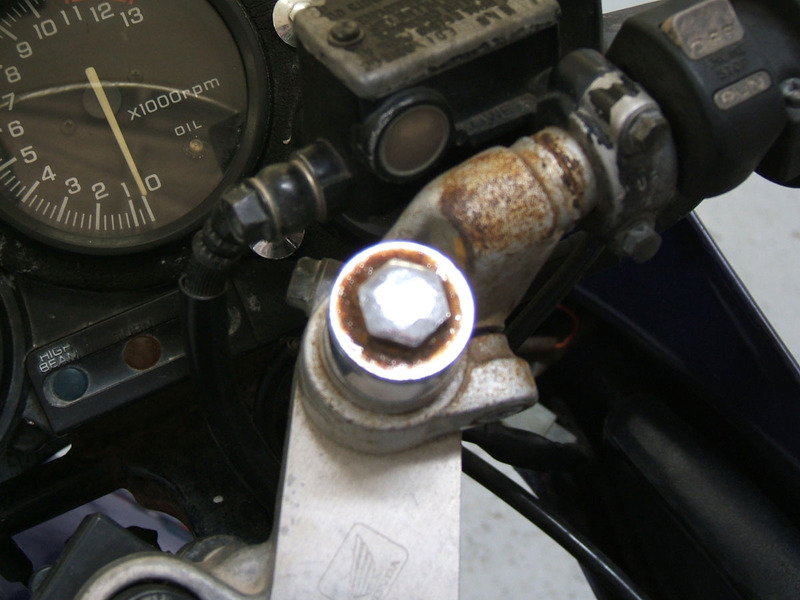 As it turned out, I think we were almost too late with our particular bike and from starting with the simple objective of restoring an example, as usual with us, things got horribly complicated. So as we said our goodbyes, we promised the owner she was in safe hands. Hard to tell what the owner was thinking. He must have had a lot memories, 16 years is a long time to own a bike from new, but given the condition it was now in, I'm not sure how sentimental he was and he might well have been relieved to have been rid of it. 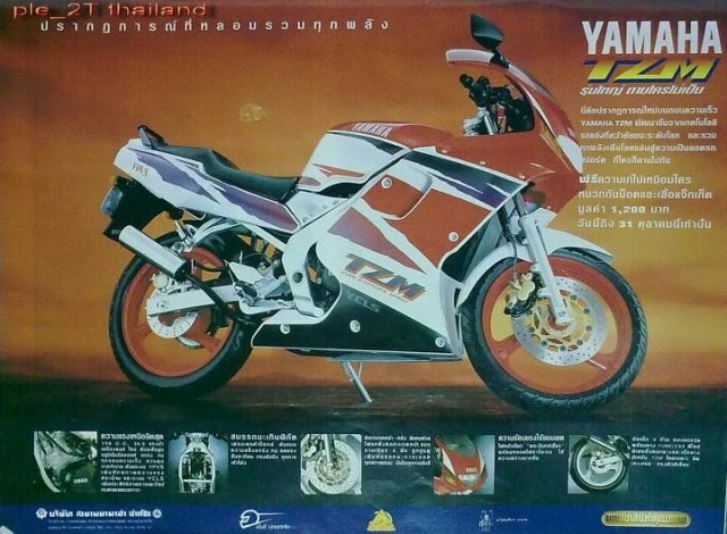 18000THB is a nice deposit for a new CBR150R or even a 250... Once back at base, we unloaded the bike and could do some more thorough evaluation. 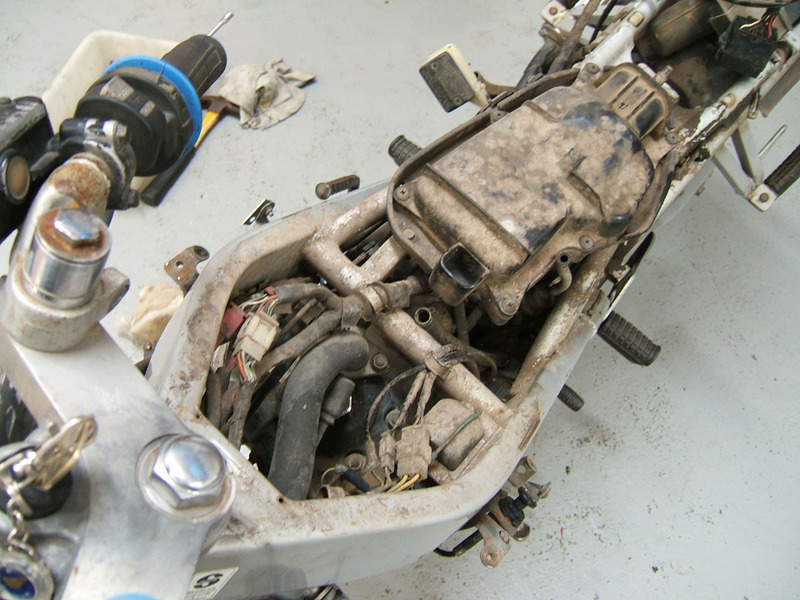 This involved laughing at some of the repairs and general condition followed by me doing a ten minute test ride. Tight it was not, but there was hope that it would come good. That wonderful 62000 km. 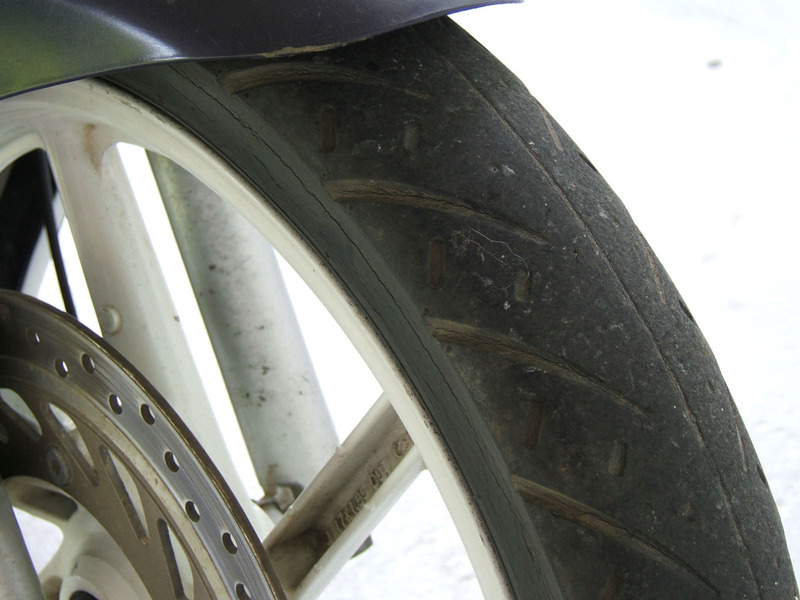 15 year old front tyre felt like it was a hundred years old and probably would have let go and killed me if it hadn't been for the RC valve servo not working (surprise surprise) and limiting us to a maximum 60 km/h. I did enjoy the test ride for some reason, though quite why is really hard to explain. 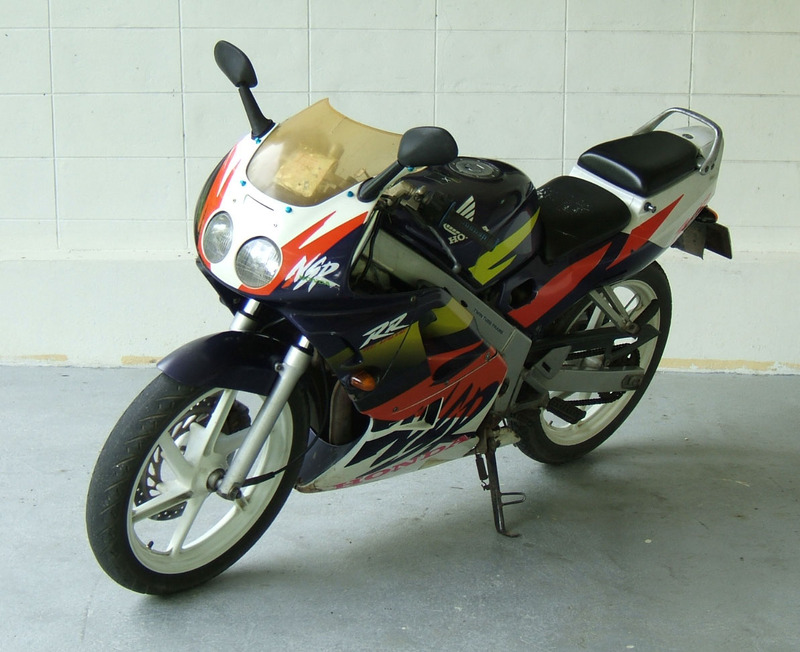 Maybe it was the NSR kudos, but this bike definitely deserved saving. 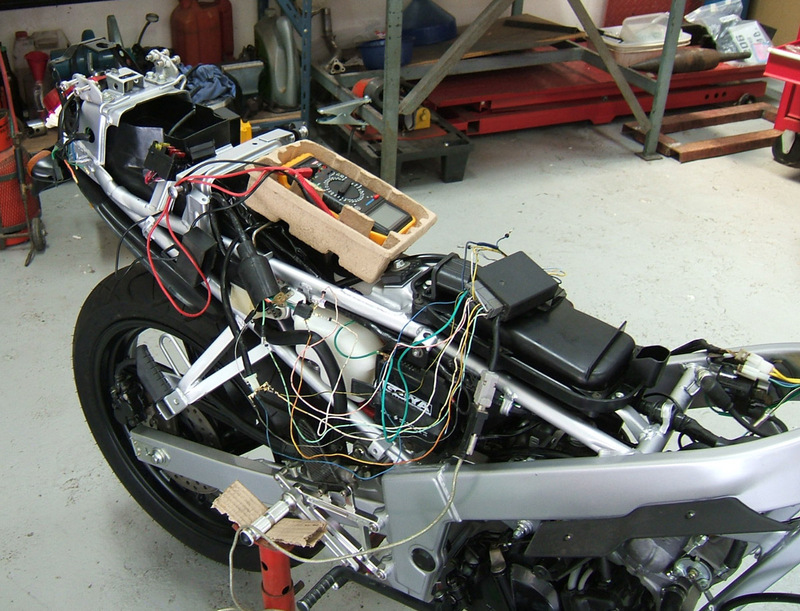 Having got the test ride out the way, we stripped the bike down. The good news was that almost everything under the heavily bodged bodywork was 100% stock and the bike was pretty solidly put together. 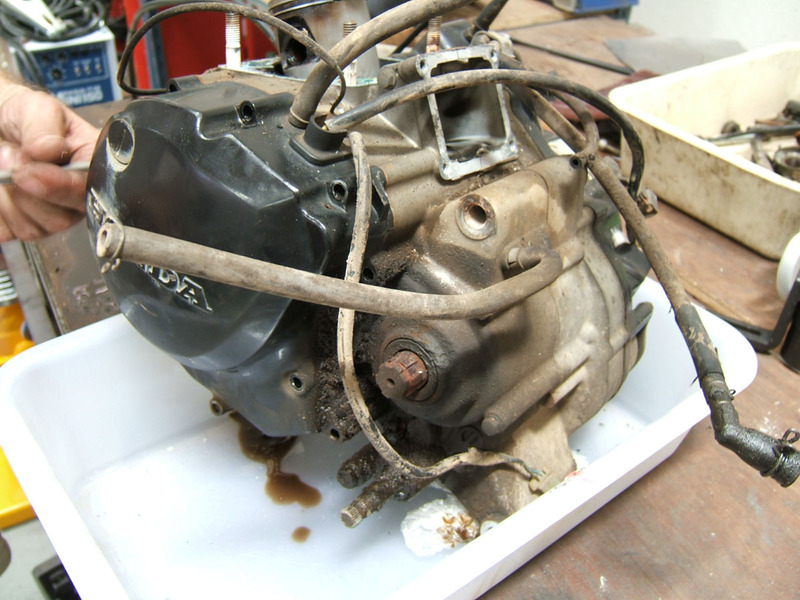 The engine had never been apart and there were no nasty repairs, unlike some of our other projects . 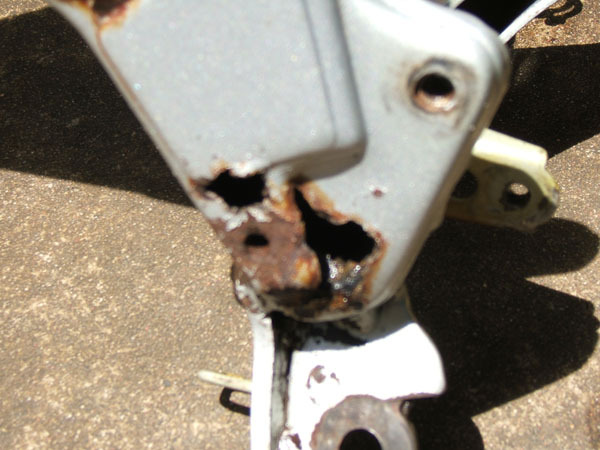 The bad news was that being a steel framed bike, it was perilously rusty around the side stand area of the frame. 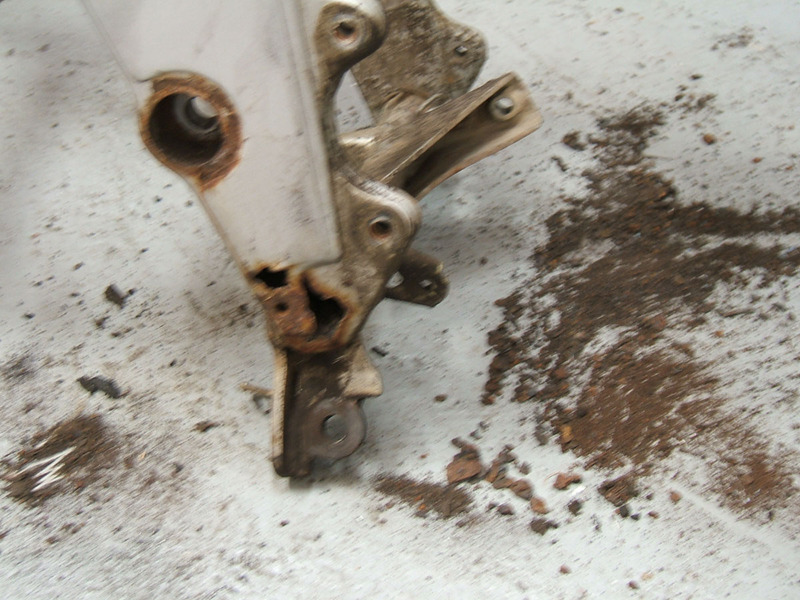 Not only that, the swing arm also deposited a pile of rust on the epoxy floor, I guess it lightened the components but not exactly in safe sort of way. 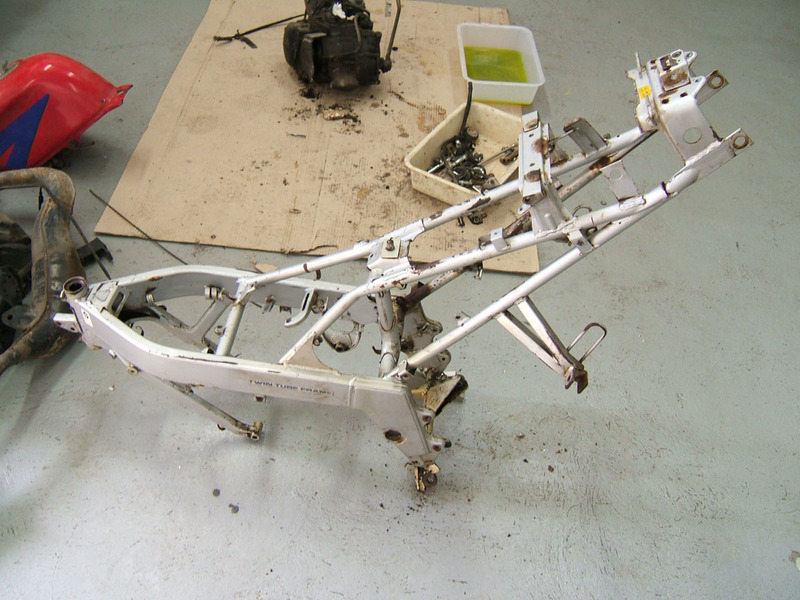 The swing arm we weren't going to use but for the frame, it was obvious that some serious repair work was going to be needed to save it. After much (delay), it was obvious the frame was beyond economic repair. 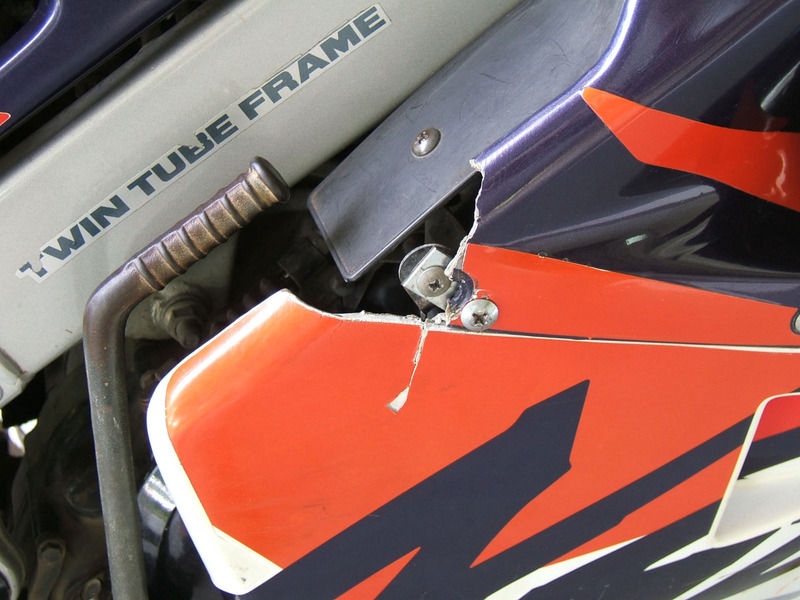 We contacted Honda and tentatively added the frame to our list of new parts. The price was right at less than 300 dollars and there was no problem getting it stamped to match an existing VIN so things were looking up right to the point that Honda told us it had been discontinued. So that put an end to that idea. Luckily, one of the fabricators knew a man who had a frame and we could have it for a mere 25 dollars. We gratefully accepted. As it happened, it came with around half a bike for another 25 dollars and so guess who had to get covered in ancient dust and oil for a second time stripping and cleaning this one? 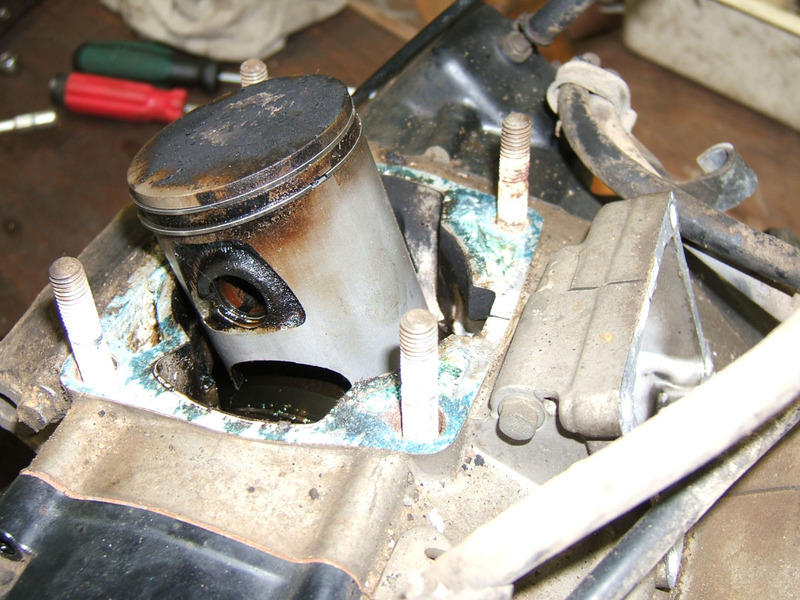 Once cleaned, we could see this also had some rust but luckily nothing Matt couldn't sort out with his TIG welder and dremmel. . I thought that would be the end of the frame saga but oh no, it goes on and on. 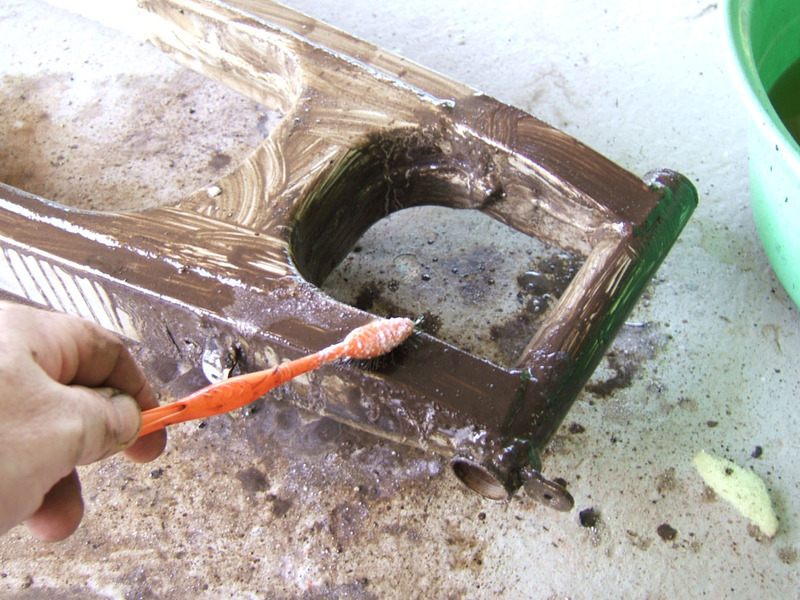 Next thing, we thought it made sense to blast it to get rid of the old paint. 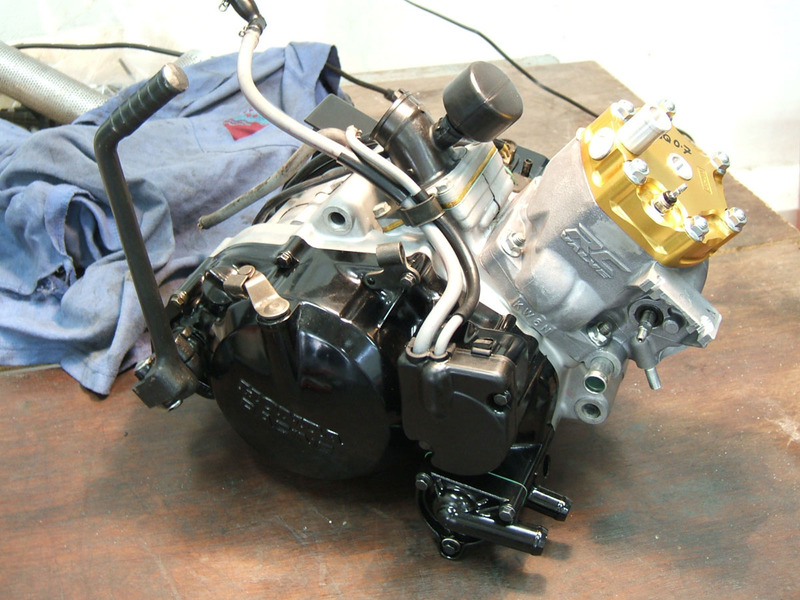 I'd soda blasted the engine cases and they came up sweet. The frame needed something more substantial than soda and we took it to an industrial blaster. They seemed to only have one setting and when it came back it had a finish like 100 grade wet and dry paper. This gave Pong the painter something to do. 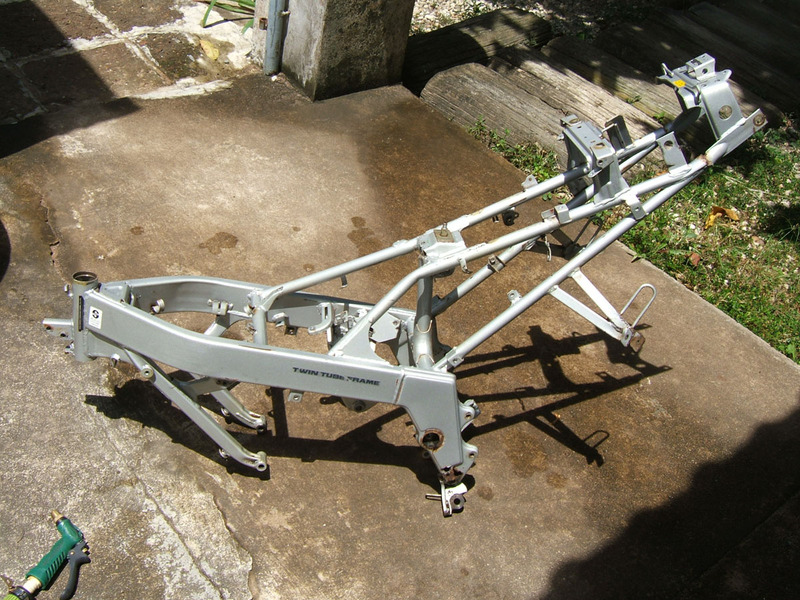 After many coats of primer and paint with sanding in between, he eventually got to a near factory finish which matches the swing arm perfectly. Fantastic! 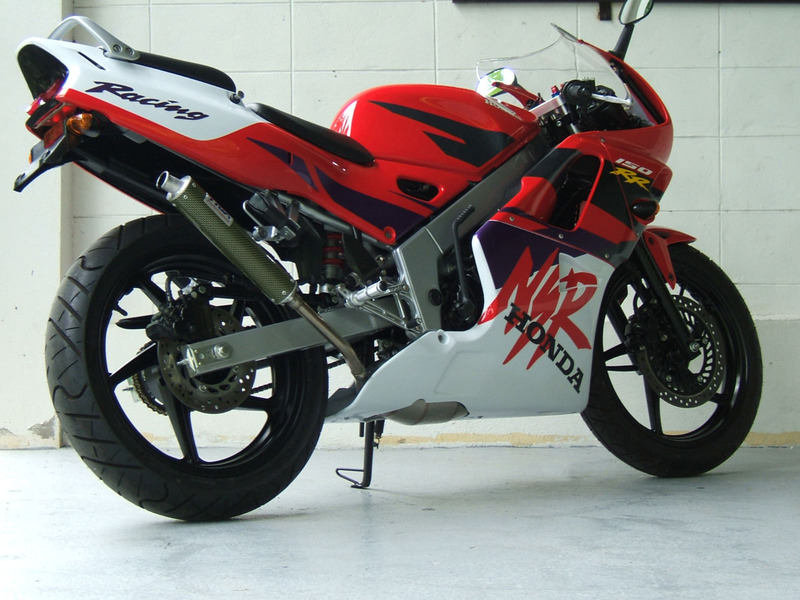 In the mean time, our long list of new OEM Honda parts had transformed into a big box of Honda NSR150RR parts from nuts and bolts to fairing panels. Surprisingly, apart from the frame and some cosmetic parts(more on that later), nearly all the mechanical parts are still available. We had fun trying to guess the prices. Some things are ridiculously cheap being made here in Thailand, while other parts which were imported and were very expensive. One of the latter was the controller for the RC valve. This gave Matt the perfect excuse he needed to splice in a programmable Ignitech unit. The instruments too, were expensive and we decided to order just the cases which were a lot cheaper than the whole assembly. 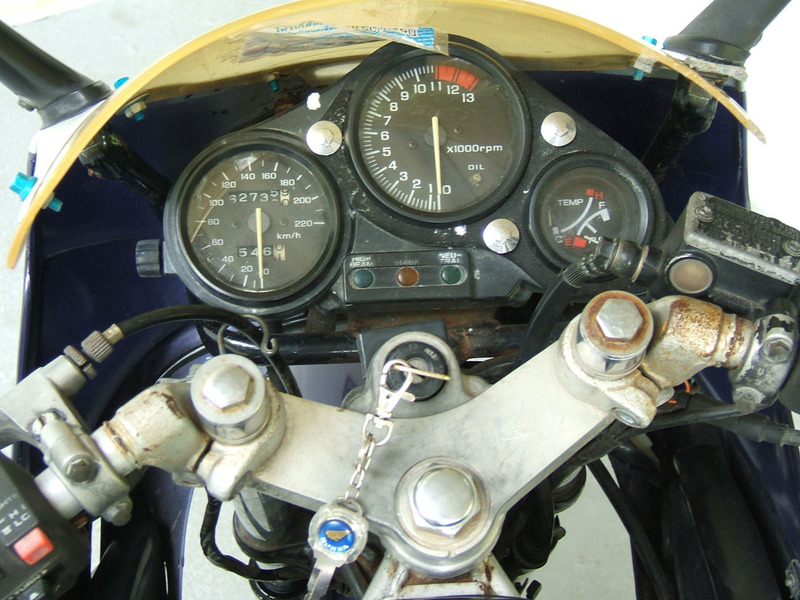 We now have brand new looking instruments registering 62000 kms to remind us of the history of this particular bike. 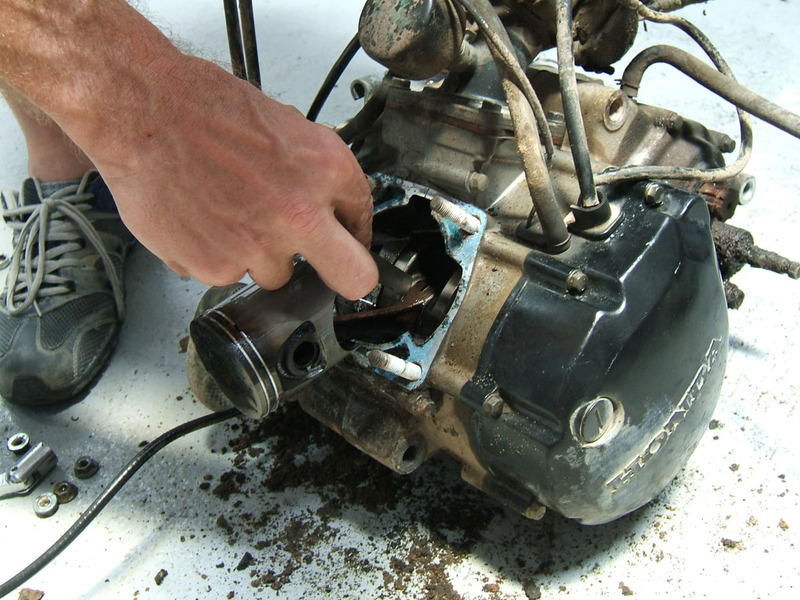 Matt had meanwhile stripped the engine despite its generally good condition. He was in his element and couldn't resist tickling the ports while it was apart. This is what he had to say . 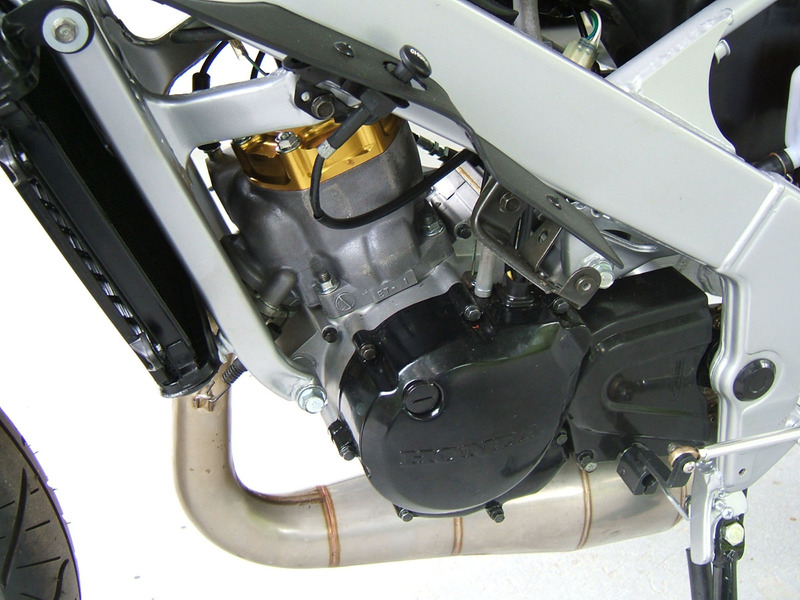 The NSR150RR engine is basically the same design as the NSR150SP, but with a less radical porting arrangement. 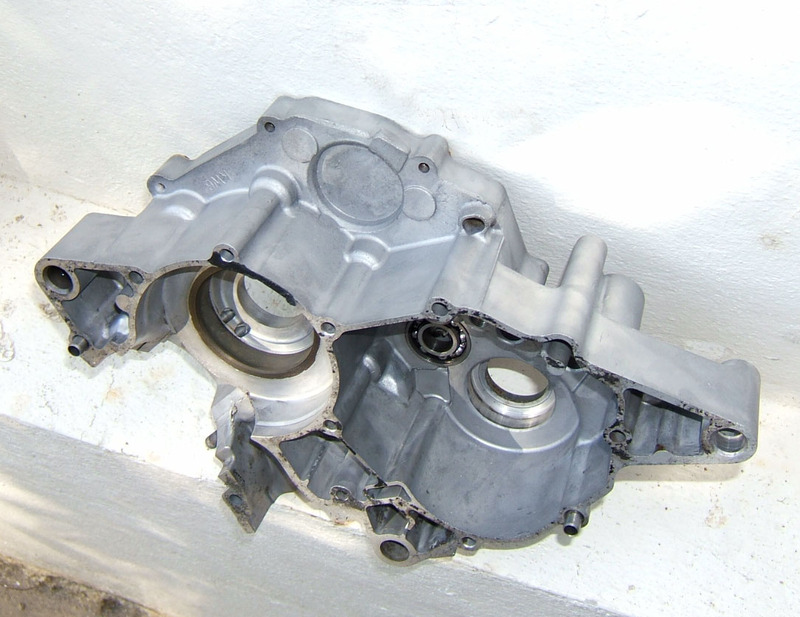 Once stripped down I could see there were no major issues inside the gearbox, but we did replace all the seals and bearings, and some nice new clutch plates. The big end bearing and mains had seen better days, so slid on an SP con rod. 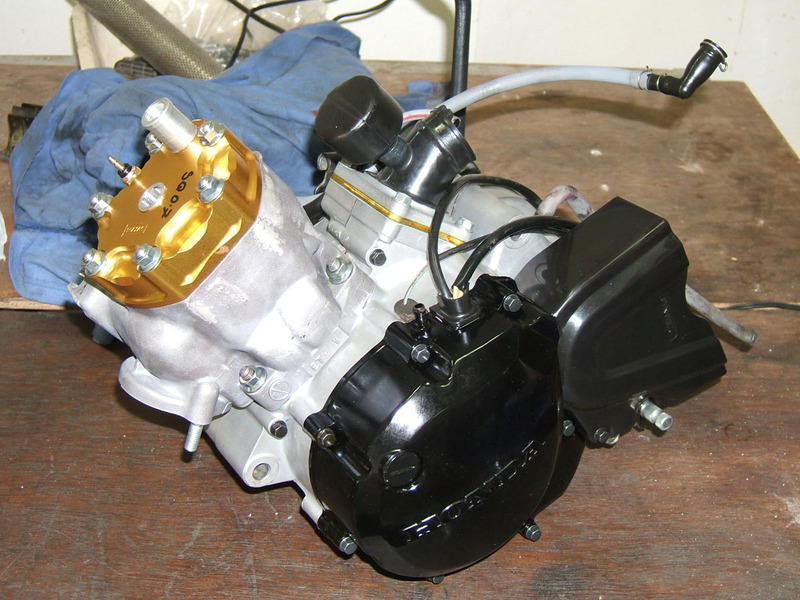 The stock cylinder and head were thrown in the big box and replaced with an NSR150SP cylinder, piston and a VHM head. 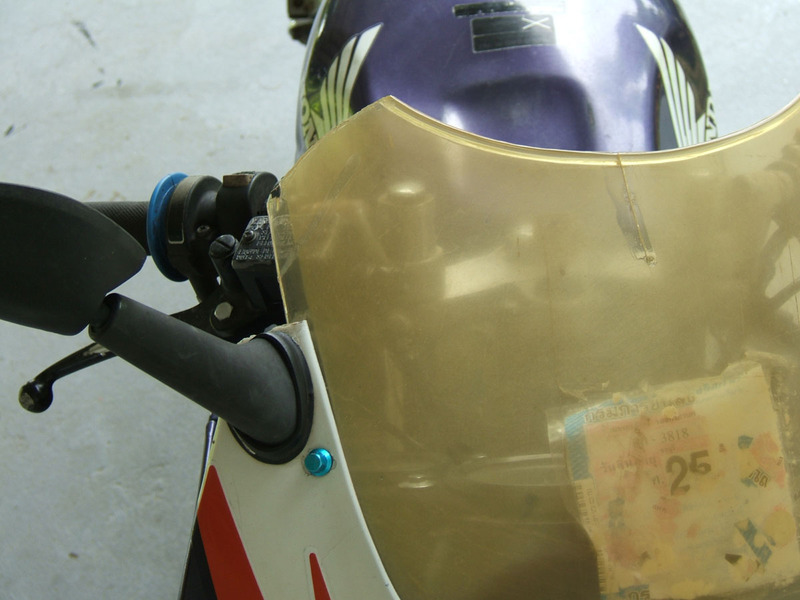 No real tuning done as we didn't want to give the bike an unfair advantage against any nearby CBR250's. But I did clean a few things up 'cos I can't resist it! 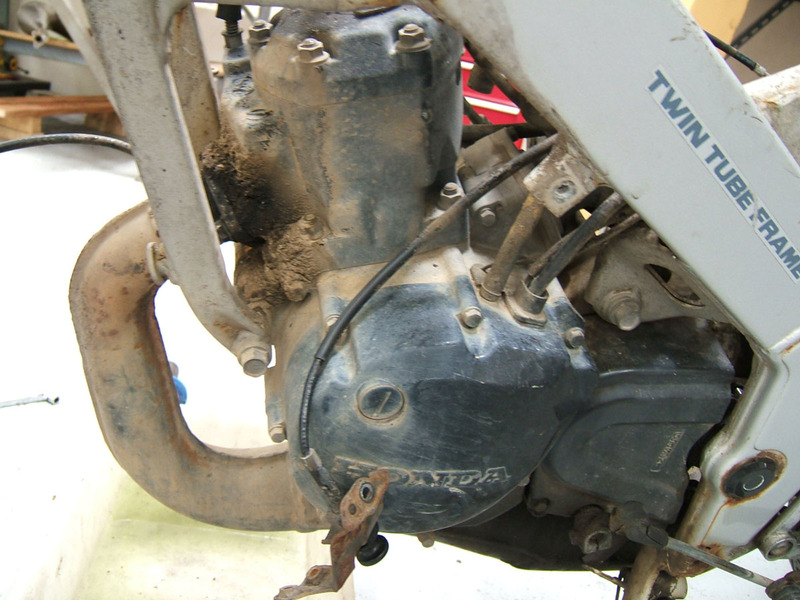 So the next complication was that we are Tyga Performance and a simple restoration job can never be kept simple. Too easy! 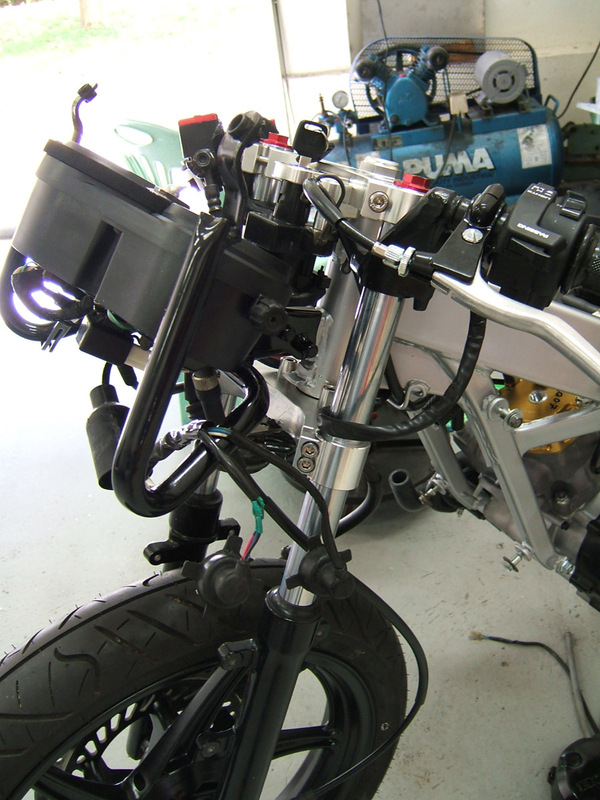 Our imaginations and our recycling habits got the better of us and, as well as the Ignitech ignition, we decided to fit the front end and rear wheel and swing arm out of a 2011 CBR150R that we had cluttering up the place. 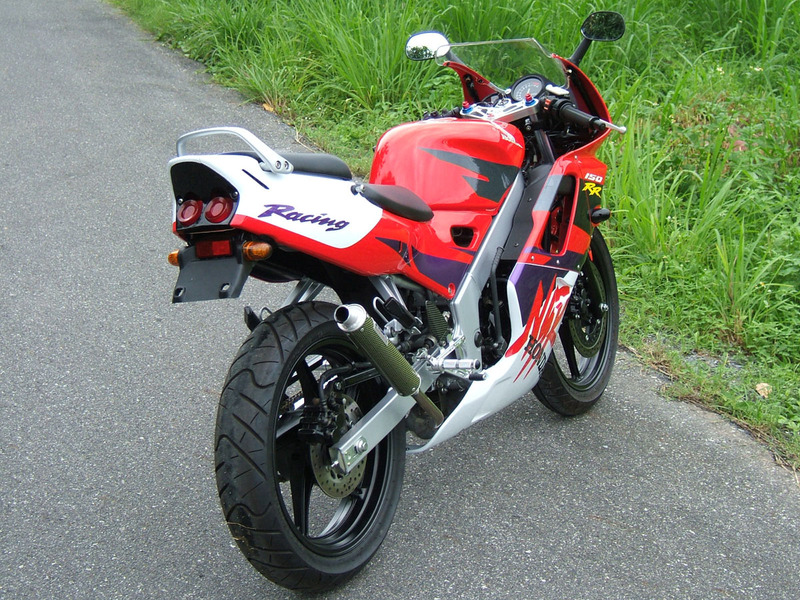 The theme was roughly this; if Honda had stuck with the two stroke philosophy and built a budget NSR150RR for 2011 instead of a CBR150R, this is perhaps what is would look like. 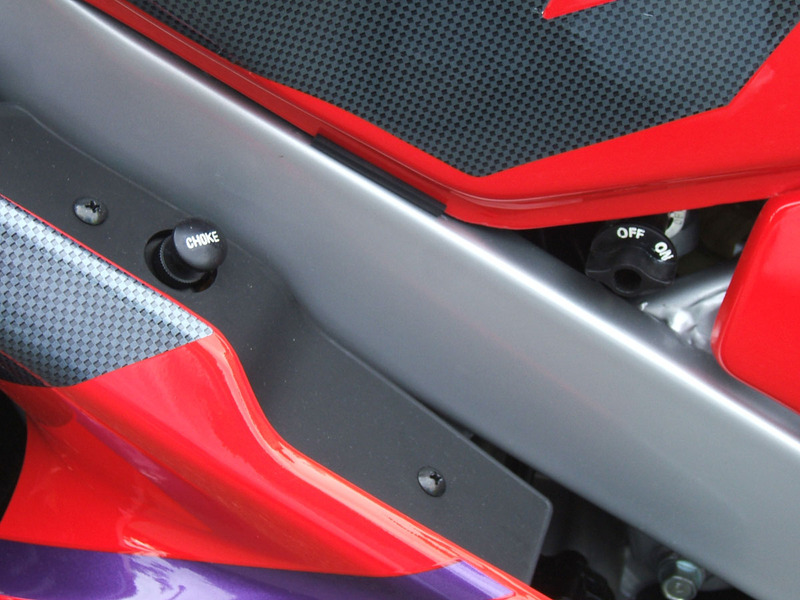 There is no denying that the 2011 version of the front end was an upgrade on the spindly 31 mm forked NSR150. That said the CBR has the same diameter forks but it does have a wider wheel, fork pitch and a better front brake system. The CBR forks were way too long and being a wider pitch meant Matt had to come up with a set of one off custom made billet triples to suit the rake and trail of the NSR. Over to Matt again. As Paul said, the CBR and NSR front ends are both 31mm, but they're different enough so that they're not a straight swap. Also, as we'd be using the CBR150 wheels and rear shock I measured everything up, made a CAD drawing and then designed my triples around the new geometry I wanted rather being dictated to by Honda. Actually Honda did help out as I called up the AP Honda ex Racing Director and he gave me all the standard geometry as a start point......good chap. 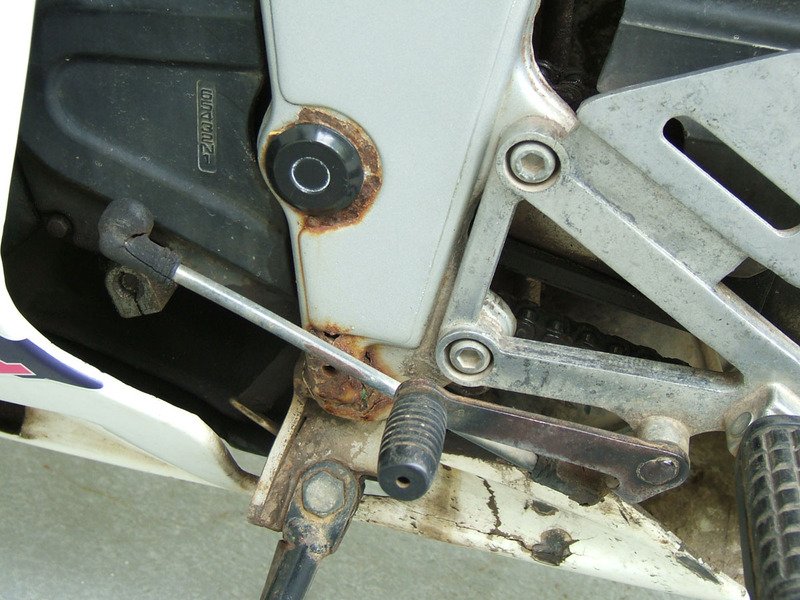 This gave us a sharper steering angle without making it too unstable. To get it all looking nice we chopped the forks down by nearly 70 mm., but kept the standard travel. It all works very nicely. 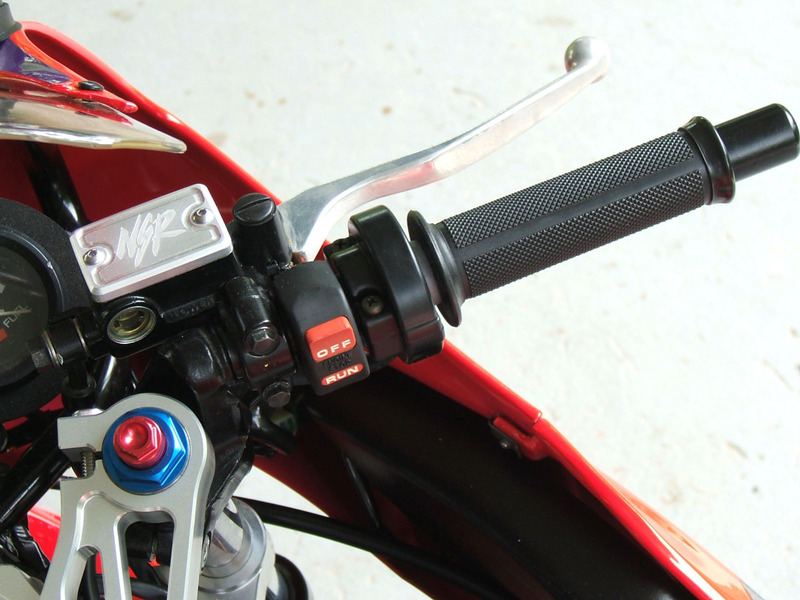 We also decided to use the CBR handlebars because we could sneak them cunningly under the top triple. 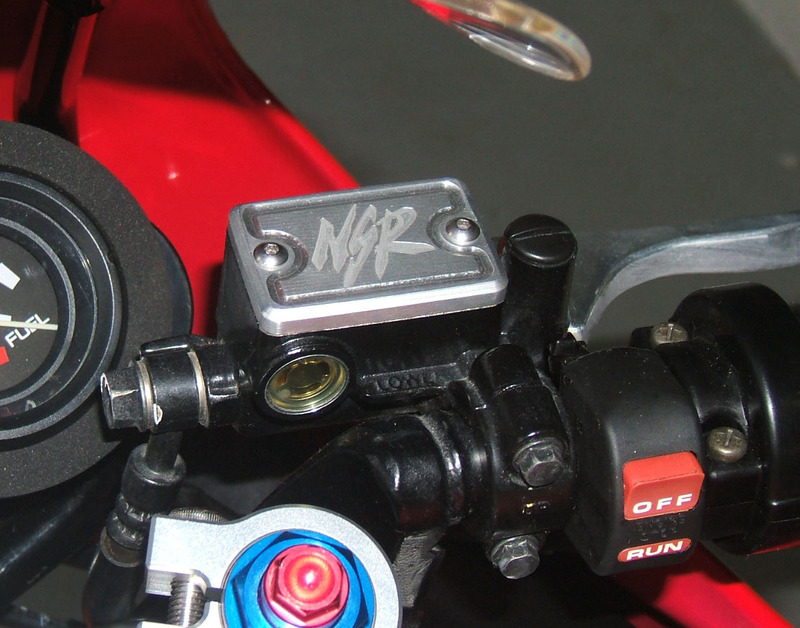 Matt not being content at that decided to make a set of Tyga preload adjusters to fit the 31 mm forks and even milled out the lid of the CBR brake master reservoir to remove the offending CBR emblem and replace it with the world championship graphic 'NSR'. 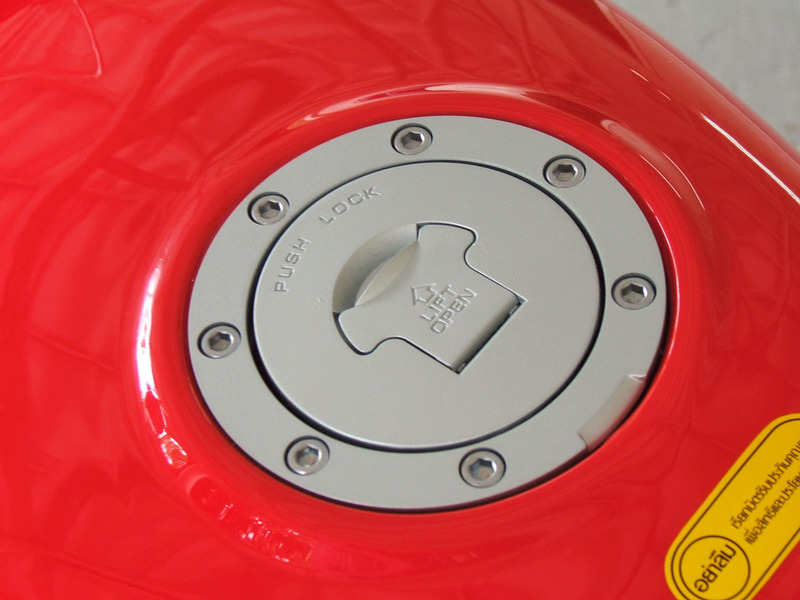 Attention to detail is what it is about and the TYGA ignition lock holder, coming from a the NSR150SP pro arm TYGA triple clamp has the NSR logo machined on it too. 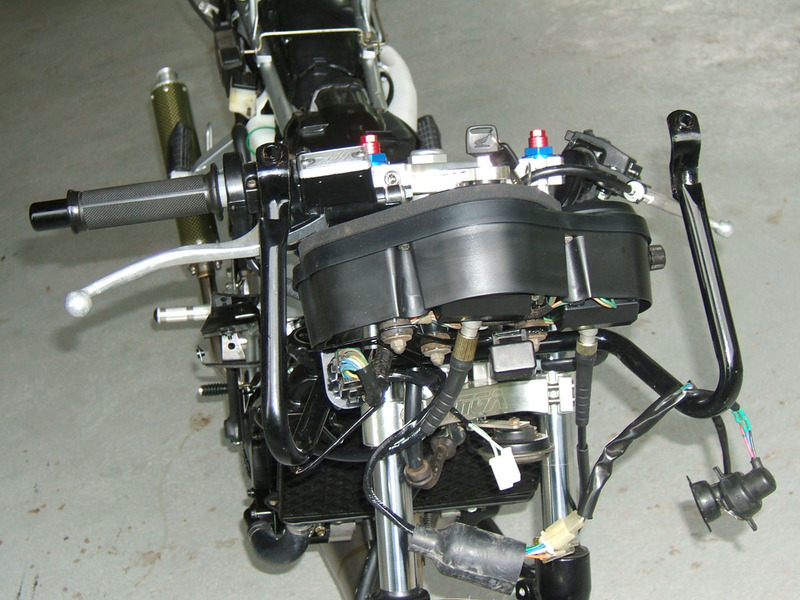 Moving to the rear end, it became obvious early on that the swing arm from the 2011 model was unsuitable. It was both spindlier and shorter. That's what you call development! So not only is the new CBR slower, heavier and uglier, it is also less rigid. What are Honda thinking? 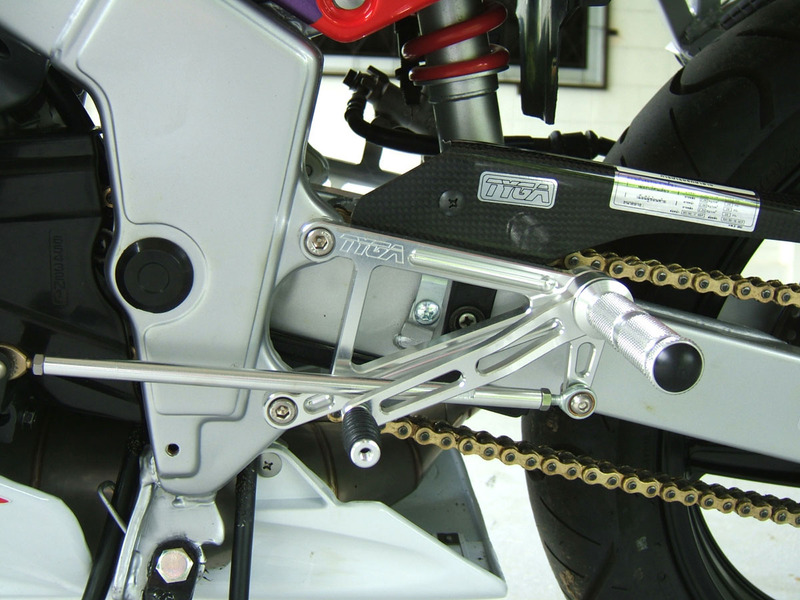 We ordered up a new NSR150 swing arm because as explained earlier, the one we had was far too rotten with rust. 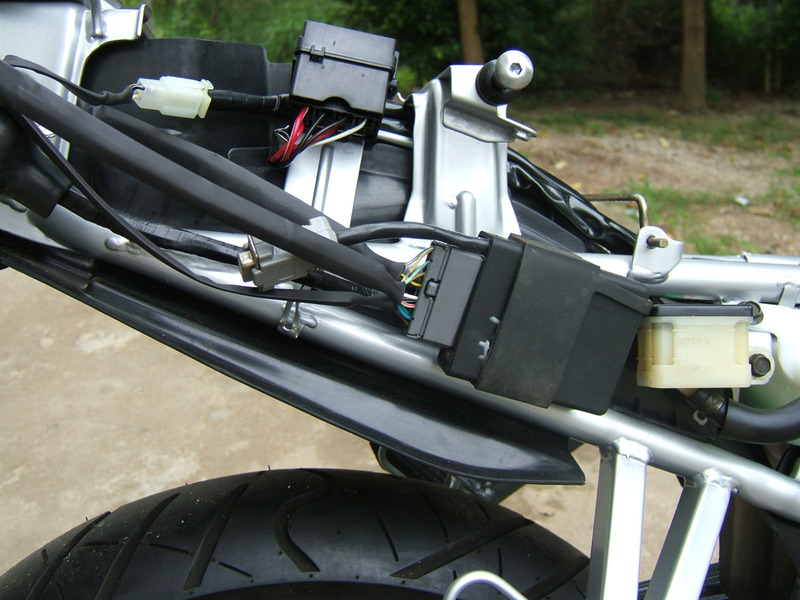 While we were at it, we ordered all the various associate parts; and there are lots of them because the rear caliper uses a long bar that is bolted to the top of the swing arm. It is somewhat quirky and frankly quite ugly. 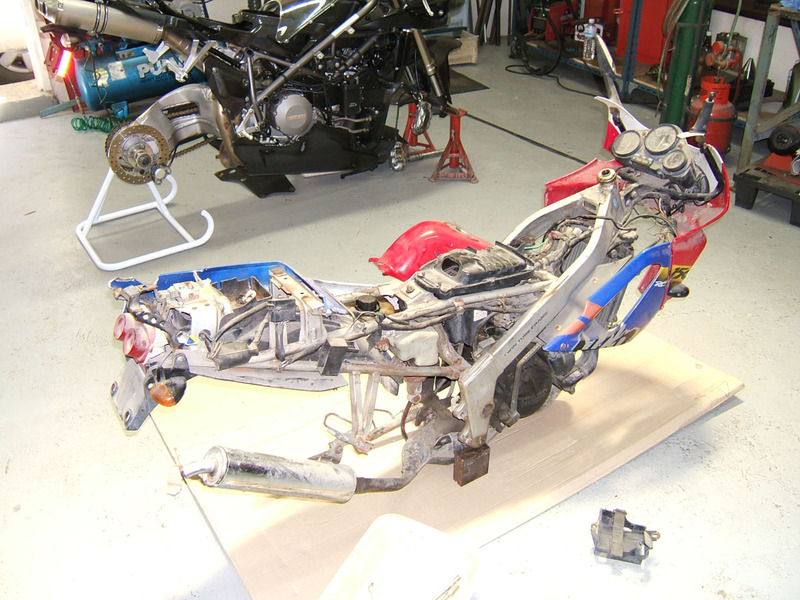 Maybe it will go later; we have another plan...Next job was the rear sprocket and the CBR150 one was all wrong for the NSR150 having the wrong number of teeth. With nothing immediately available that would fit the wheel in a 428 pitch with the correct number of teeth, it gave Matt the perfect opportunity to get back to his drawing board. 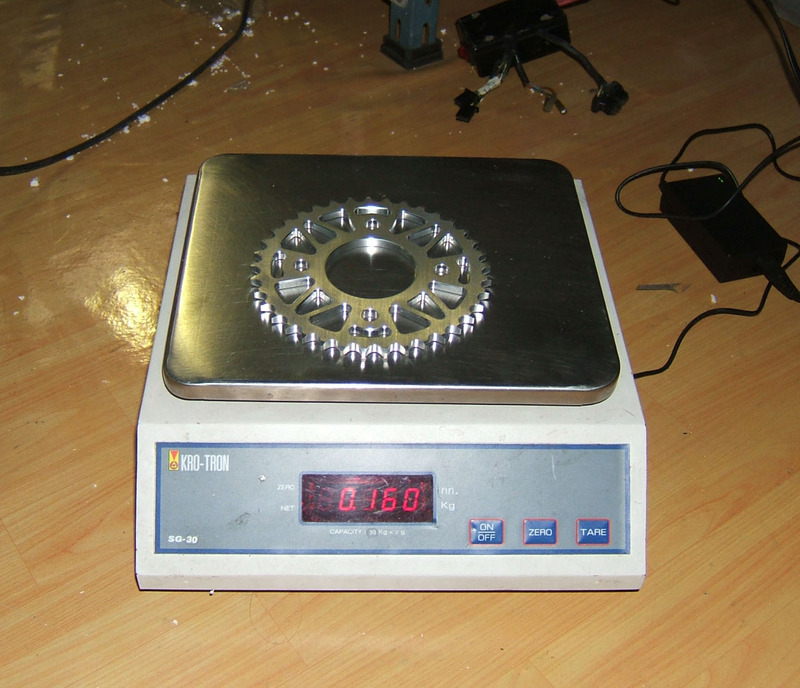 In no time at all, we had a custom made aluminium sprocket weighing a third of the one it replaces. 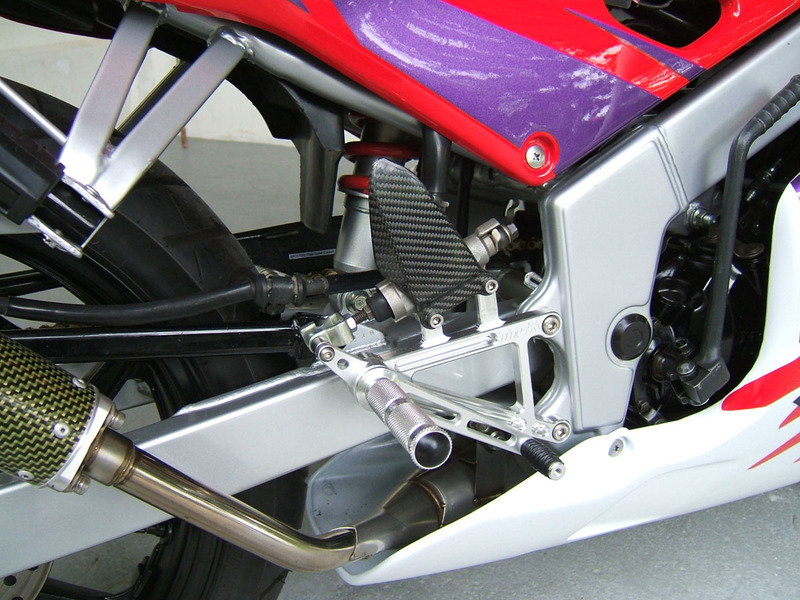 The rear CBR150 wheel shaft was now all wrong too so it needed special spacers to take up the slack and deal with the smaller diameter of the CBR150 wheel shaft (More Honda backward development). Matt came to the rescue with some top hat bushes which go through the wheel shaft holes in the swing arm and the result looks factory. 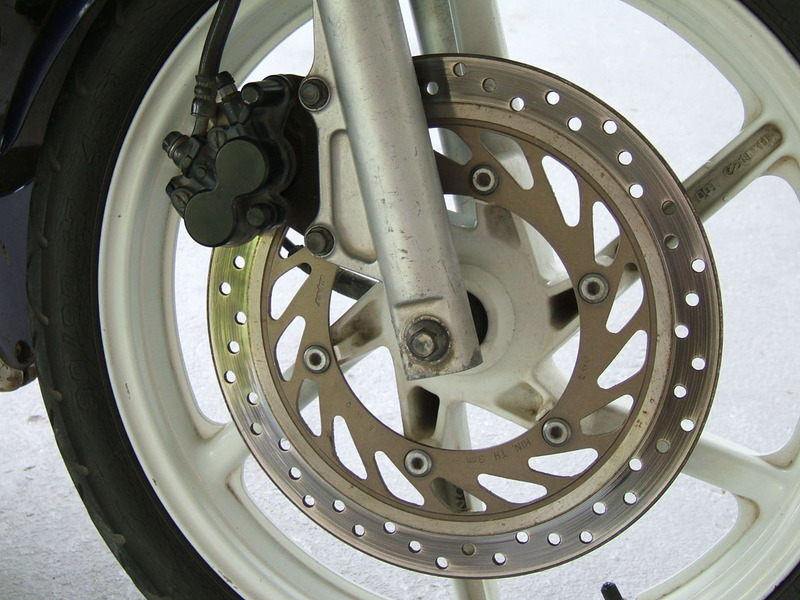 Luckily the brake rotor was compatible with the NSR caliper construction. 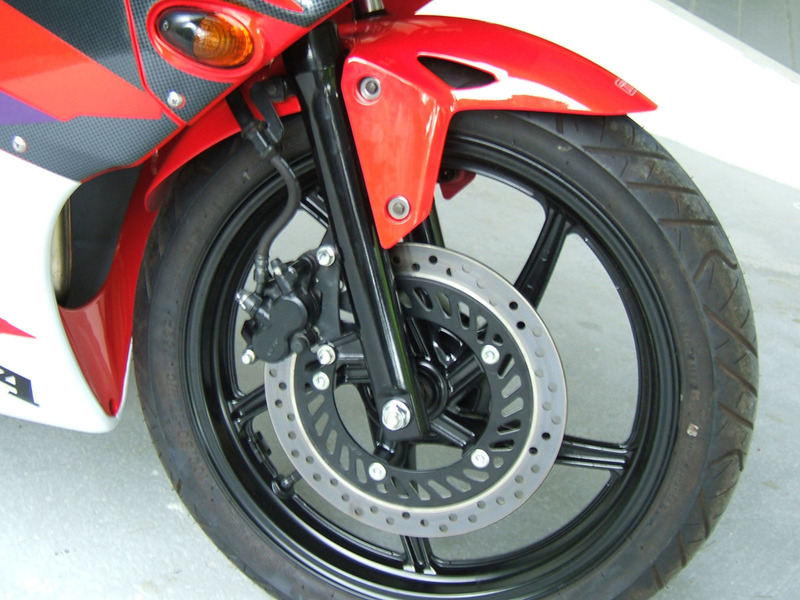 We offered the CBR rear shock up and it fitted perfectly and it even has some extra ride height as a bonus. 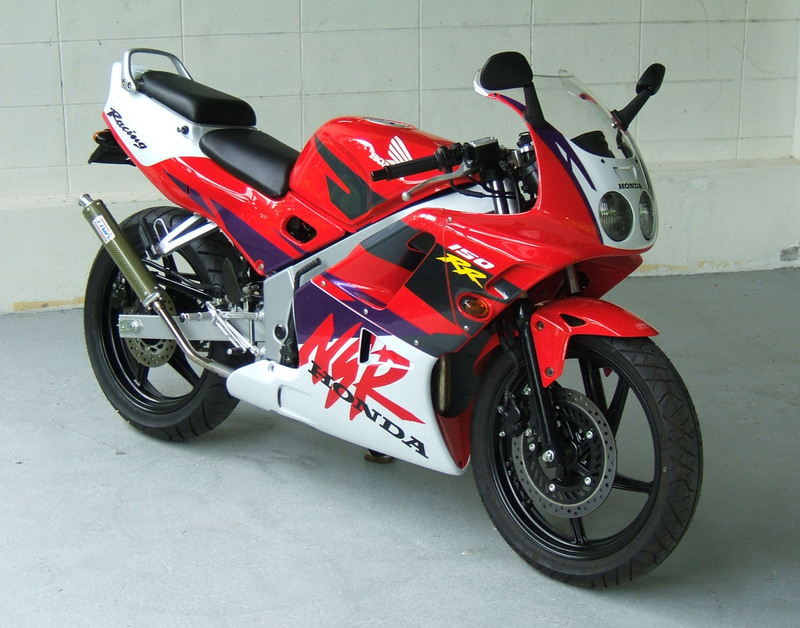 It is a bit softly sprung but in much better shape than the poor old NSR one it replaces. 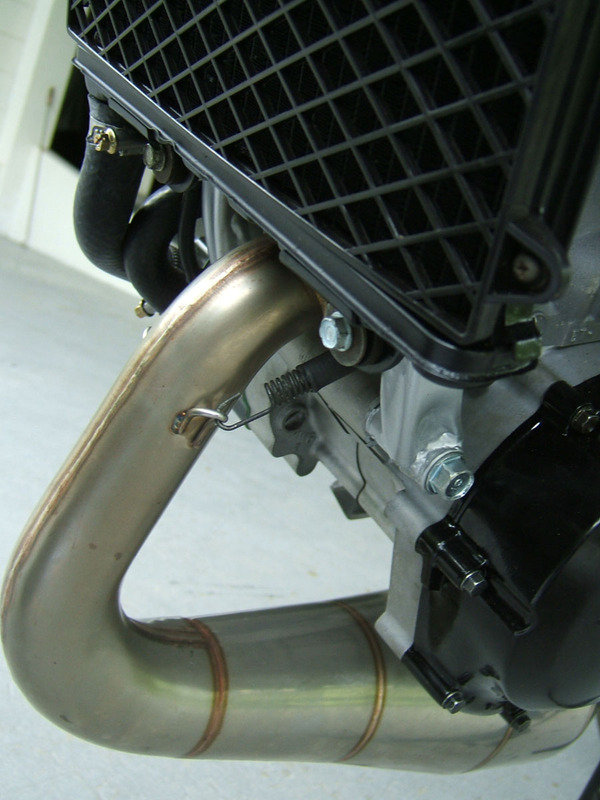 TYGA Performance NSR150SP exhaust system with carbon/Kevlar silencer was installed and although the chamber to frame stay needed an extra bracket, it was an easy fix. 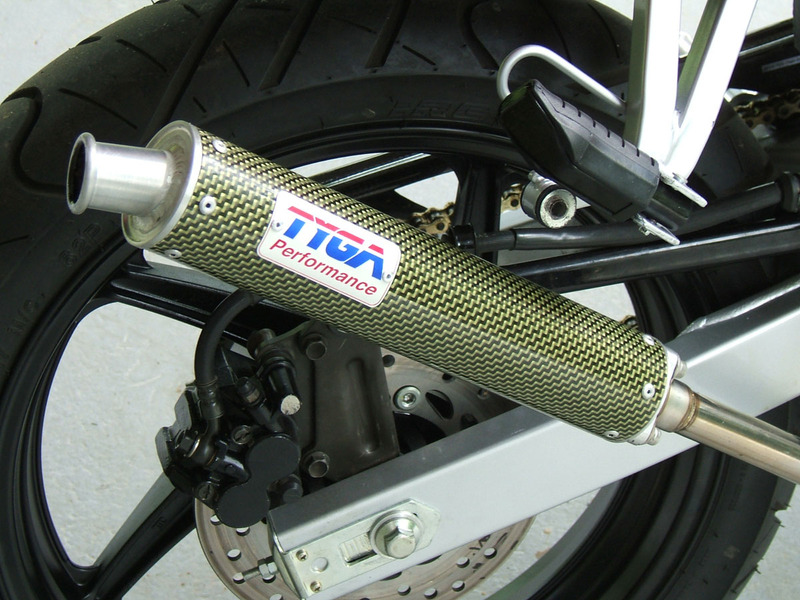 A TYGA step kit from an SP model slotted into place without issues. 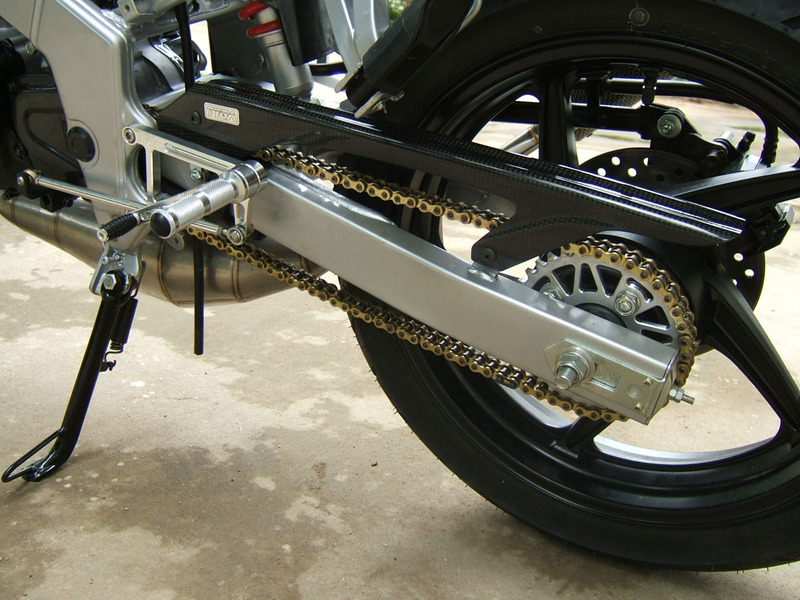 A TYGA R1 carbon chain guard was cut and a bracket made up and fitted to give the swing arm some cred. 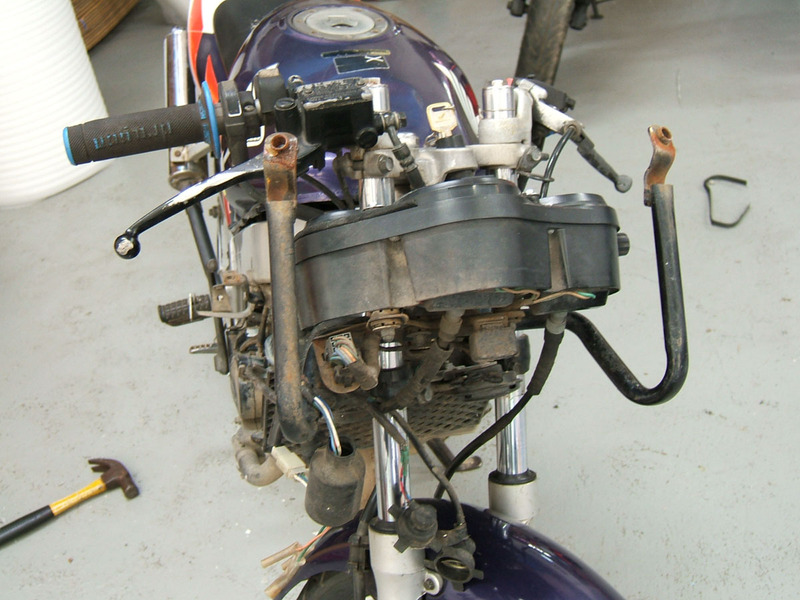 The original plan was to buy all new bodywork and fuel tank in the HRC colours and simply assemble them on the bike making the bike look factory new without need for paint jobs etc. This went out the window almost immediately. 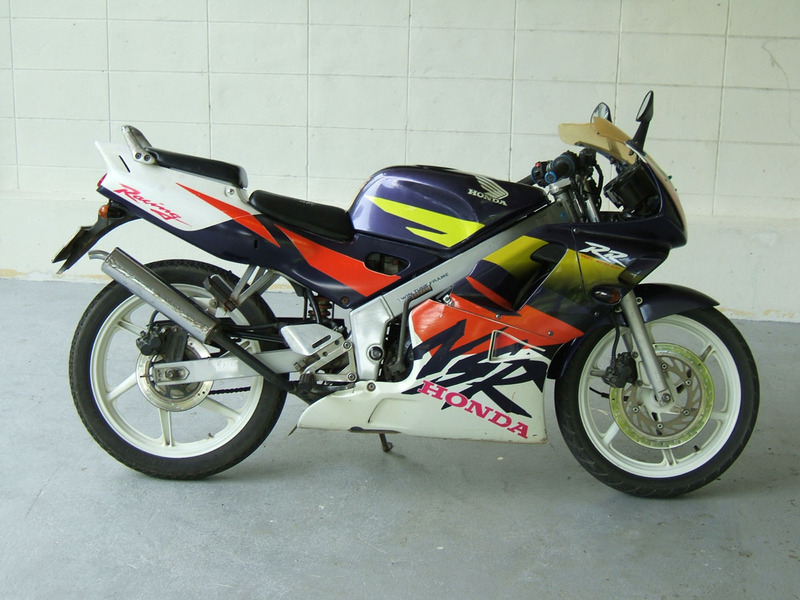 Firstly, we realised that Honda as usual, had decided to use a much less exciting colour for the production replica than the colour that was used on the factory racer. 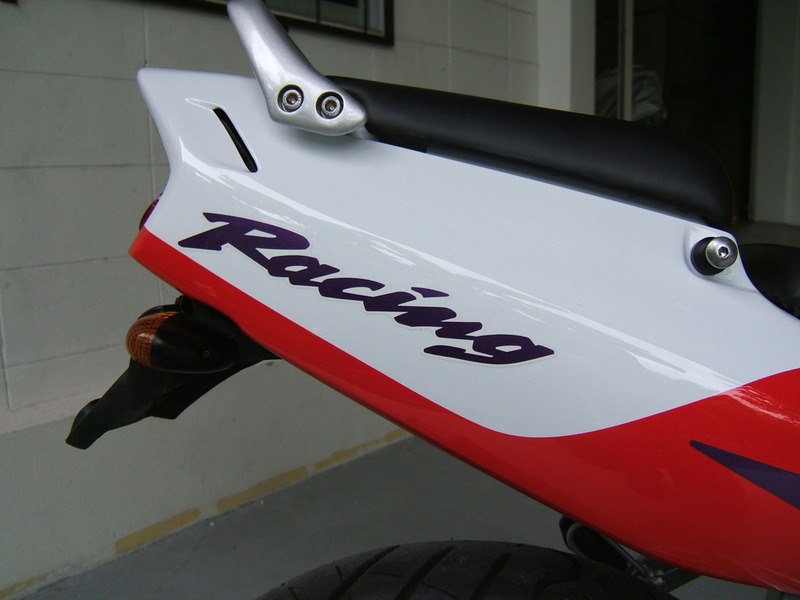 Having the skills of our in house painter at hand, K Pong, and acquired some very bright red with a fluorescent tint to it, we made the easy decision to paint the bike the correct factory racer colour. This decision was reinforced when we learnt that the fuel tank had been discontinued in the HRC scheme (though we did get a new one in an alternative scheme from a local dealer). This change of plan to paint the red a different shade added more complication because the red needs to be matched on those hallowed NSR logos so this all had to be painstakingly masked and painted to match. 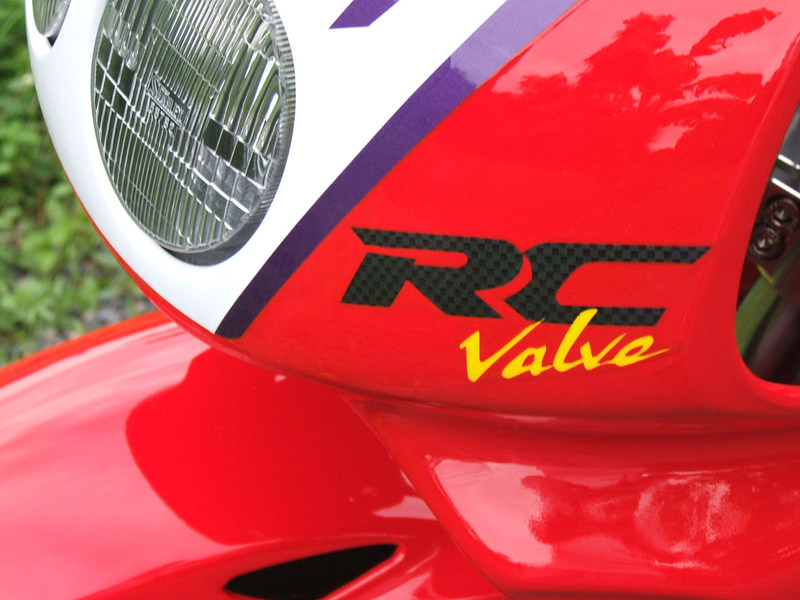 Just to confound us further, a few of the stickers were discontinued including one of the faux carbon ones. This being impossible to match meant we had to order some repeats of the other stickers and cut to suit. And then the stickers which were available have been sitting in a warehouse for 15 years and have lost their stickiness. All in all, what should have been an easy part of the restoration, turned out to be very challenging episode but the results were well worth the effort. Having mounted all the bodywork, we took the 'En' for a test ride. The bike felt tight, like new one but then it mostly is! 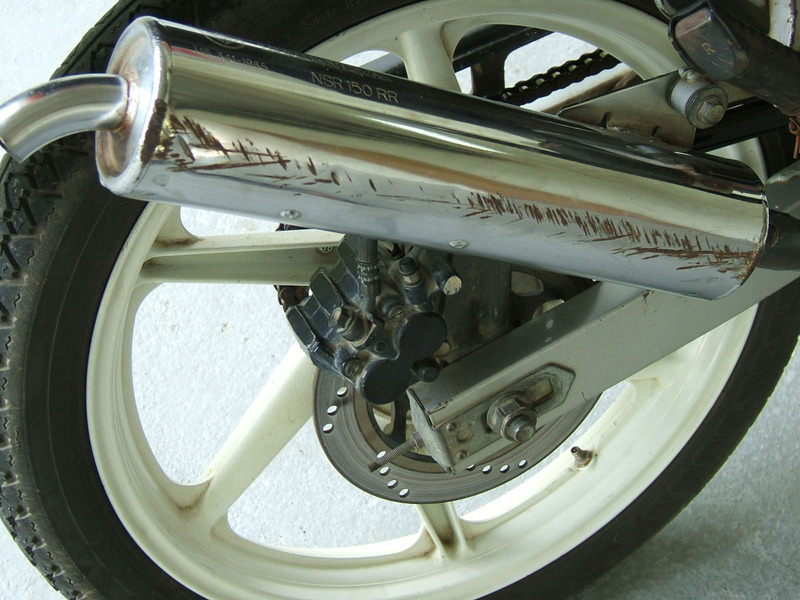 The brakes and suspension were up to the task of street riding. 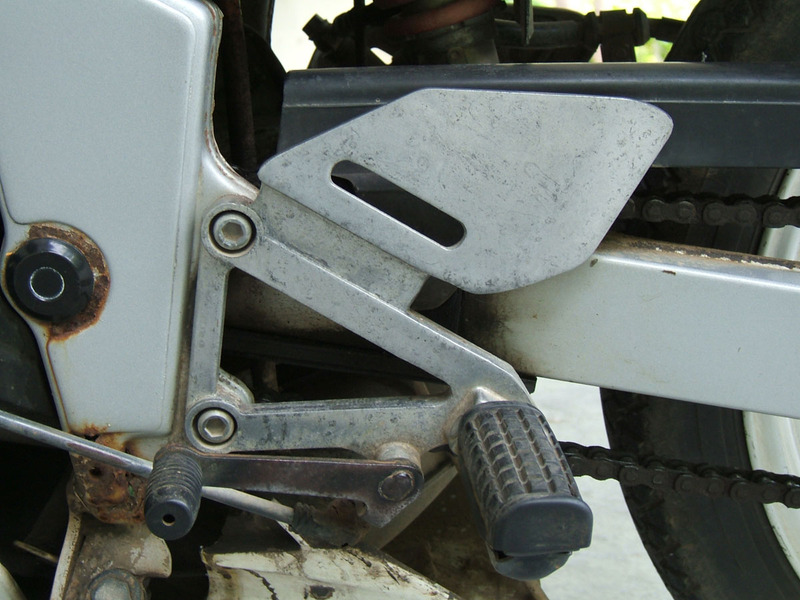 Although this bike is positively ancient, because of the condition or colour, it attracted nearly as much attention as the Ducati 848. 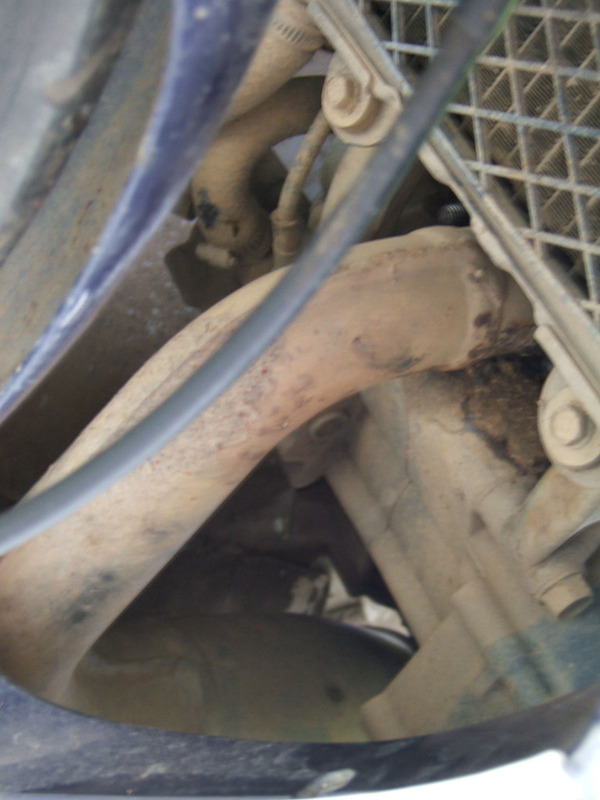 On the other hand, it might have been nothing to do with the looks but the noise coming from the exhaust. Being a 150, required a fair fist full of revs to get it rolling. Luckily, with Matt's fettling and settings on the Ignitech, the power curve was perfect from the start. Not sure how much was luck and how much down to experience (Matt has done hundreds of dyno runs on these bikes during his racing career and managed to get close to 40 horsepower out of them without the help of the better SP cylinder) but the performance of this bike came as a very pleasant surprise. I wasn't sure how high I was supposed to rev it, especially because we had not confirmed the jetting was ok with a plug chop yet but it really got going at around 10,000 rpm and was still climbing at 12,000 when I thought it wise to change up. The hopelessly optimistic speedo was telling lies as they are prone to do on these 150s (a marketing stunt) and telling me I had cracked the magic ton (100 mp/h or 160 km/h). I am sure we hadn't achieved that yet, but it was certainly promising me we would with another gear to go. 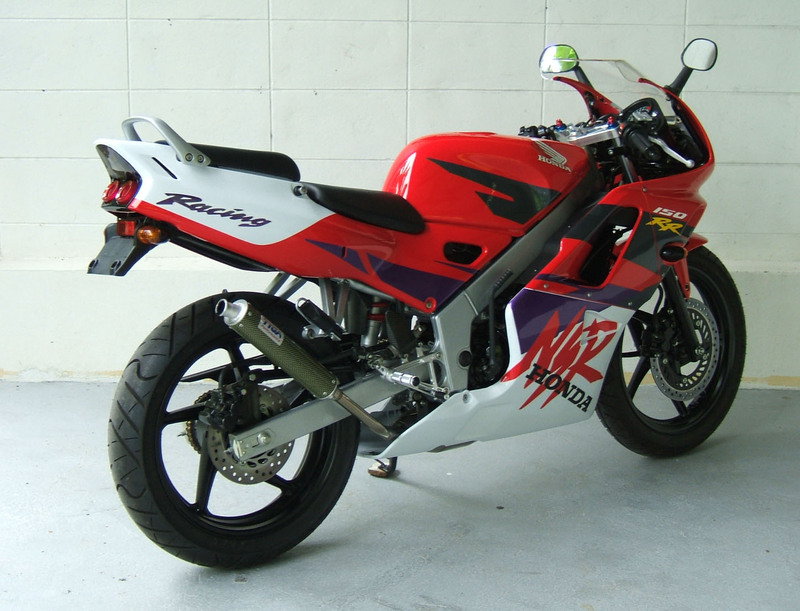 This bike is going fly past the CBR250R. I can't wait until we do a back to back test. Bring it on! 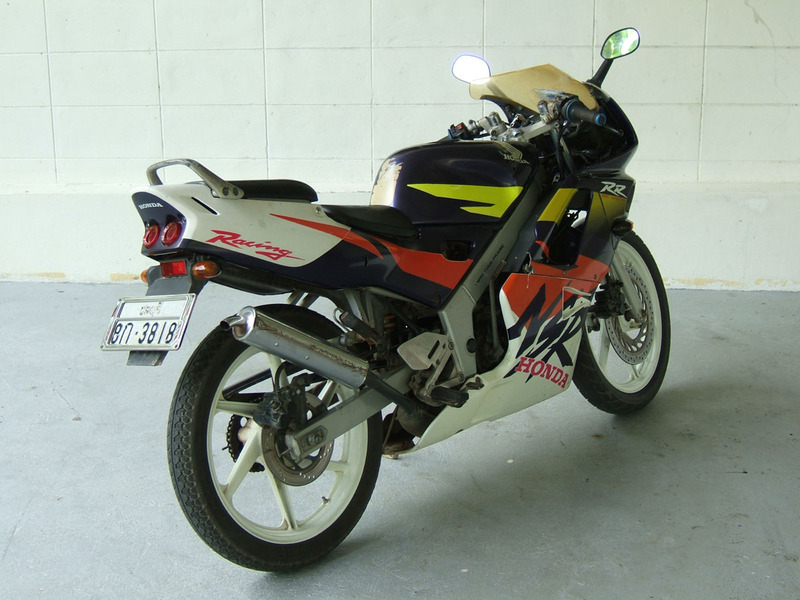 Although building an NSR150R may not be possible in your country, We hope this project gives you inspiration to take on a similar project because the rewards are well worth the effort. 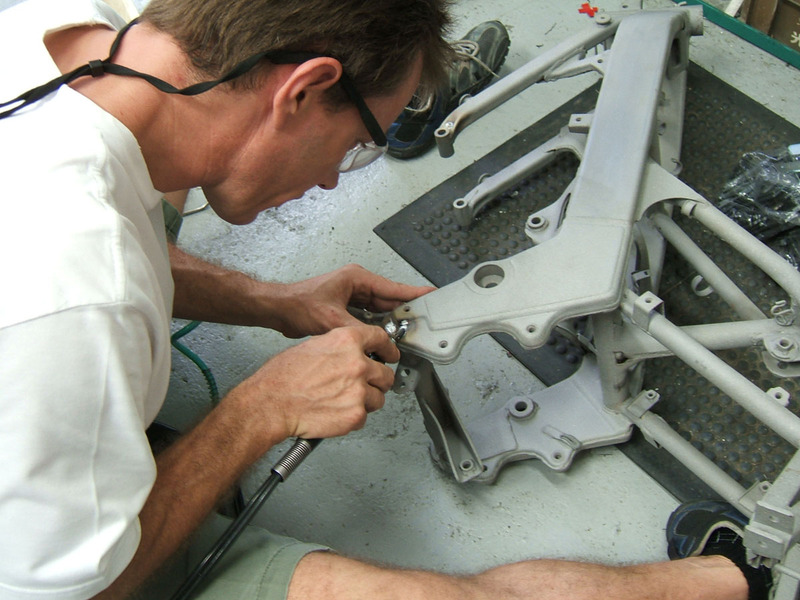 If you need parts or advise, don't hesitate to contact us.